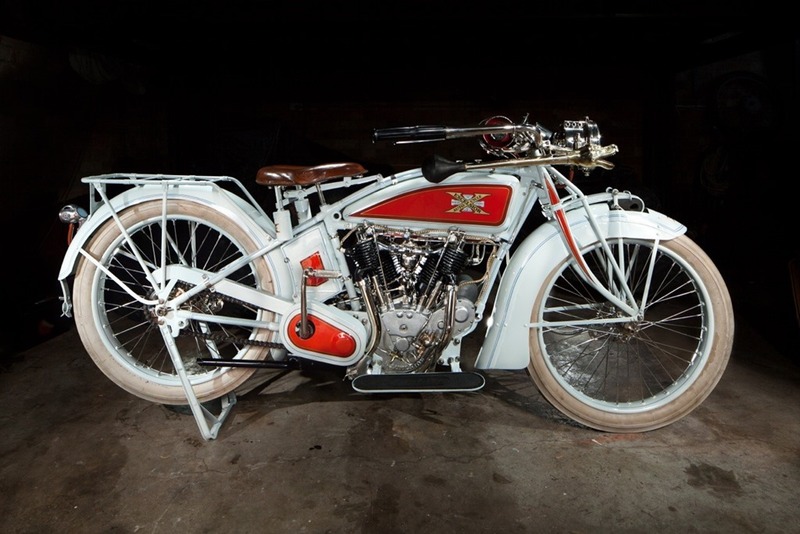 Antony Gullick has been working for a few years to restore his 1917 Excelsior, and sent these wonderful photos of his results. 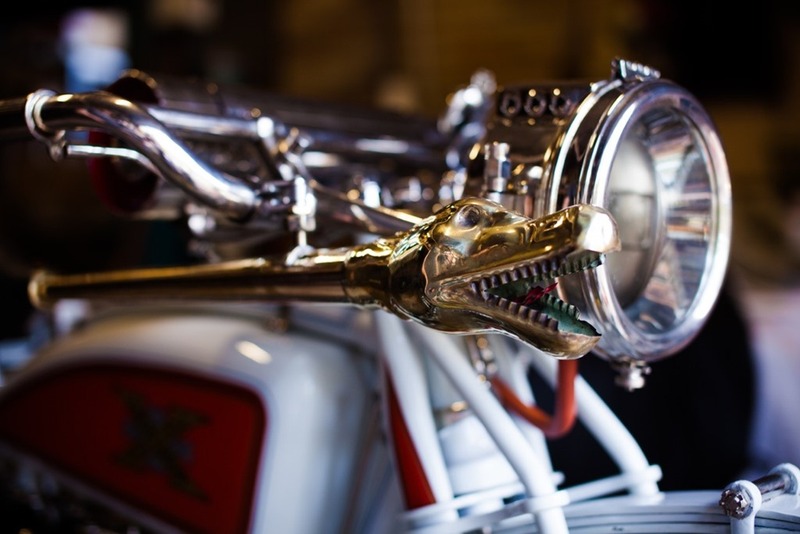 The pics were taken by Adrian Veale and show a lot of neat details. 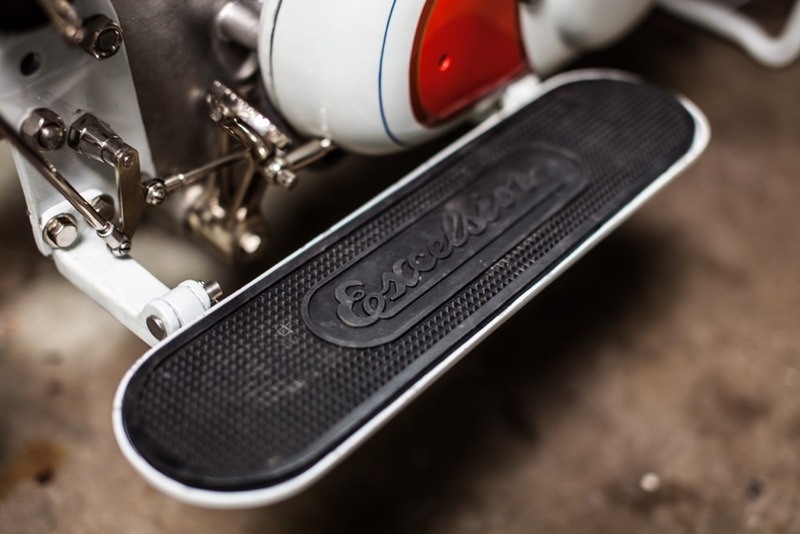 If you are working on an Excelsior, hopefully these photos will help you. I could have used them back when I bought my boxes of parts and had to decipher how they all went together! 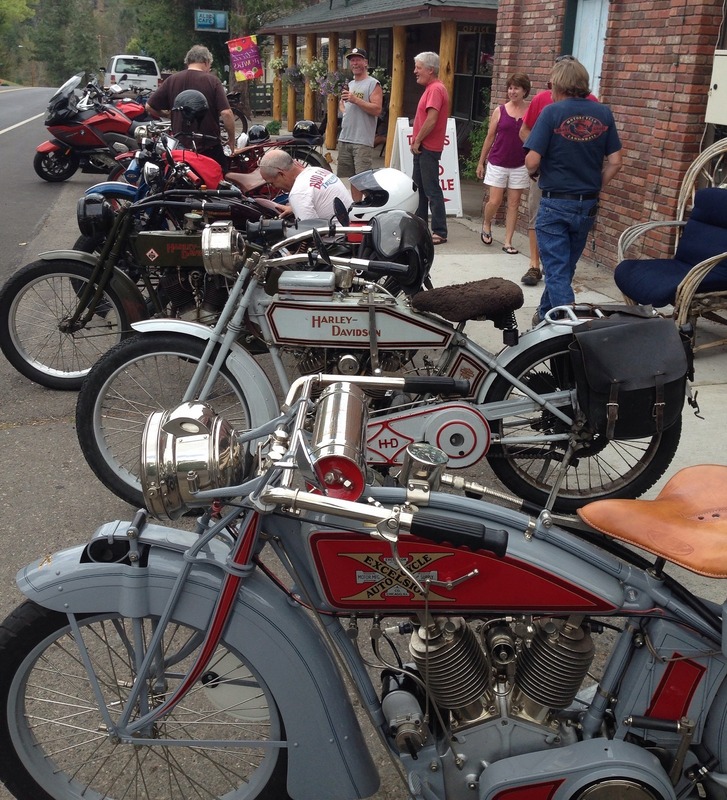 Sunday was the annual Pioneer Run for pre WWI motorcycles. 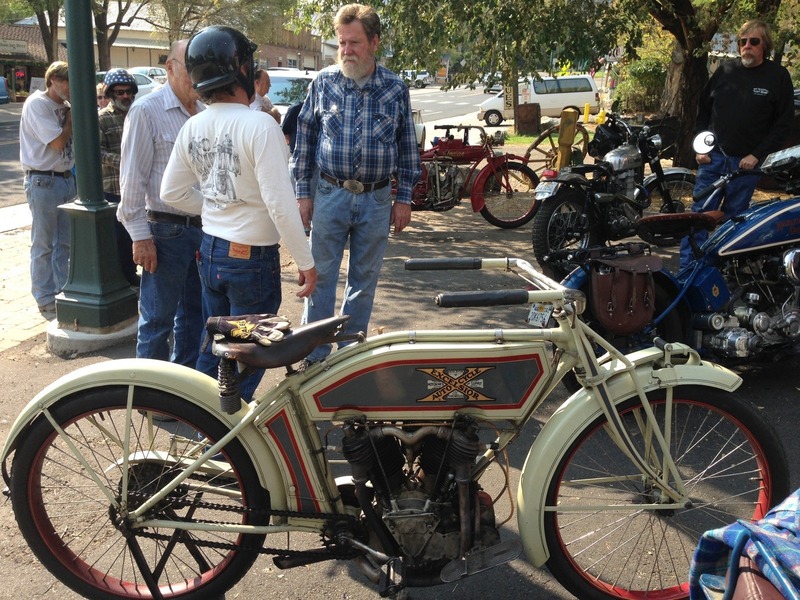 It continues to be the world’s largest event for bikes of the era, with about 300 machines participating each year. 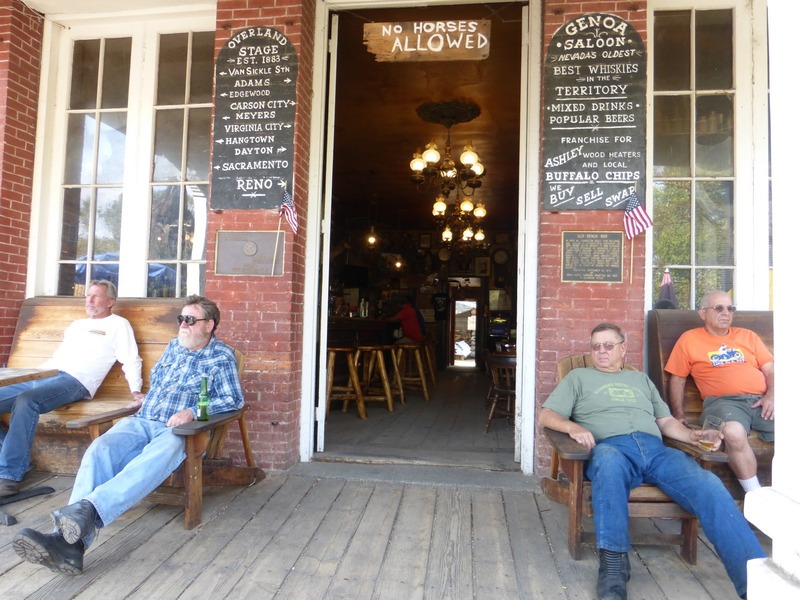 Click here to see photos from previous years. 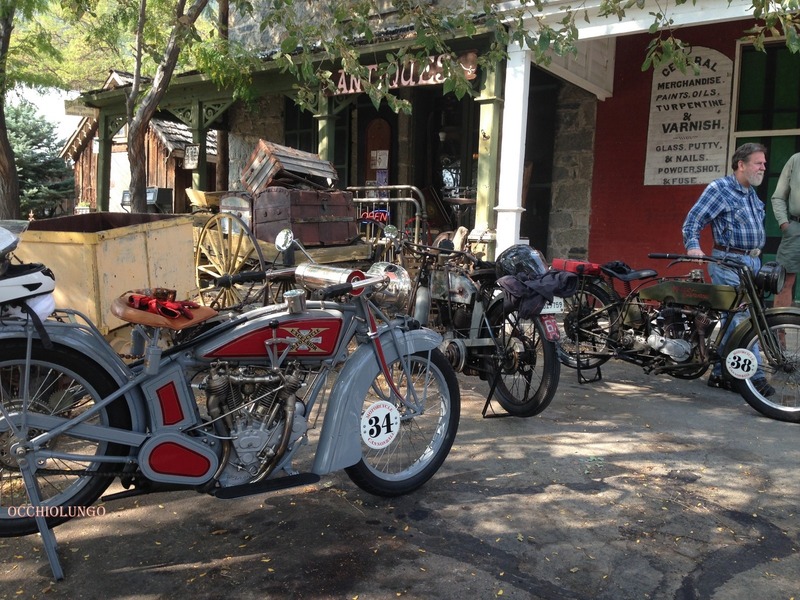 The run is hosted by the Sunbeam Motorcycle Club, which is open to all old bikes, not just Sunbeams. I’ve attended the last two runs, but stayed home this year. 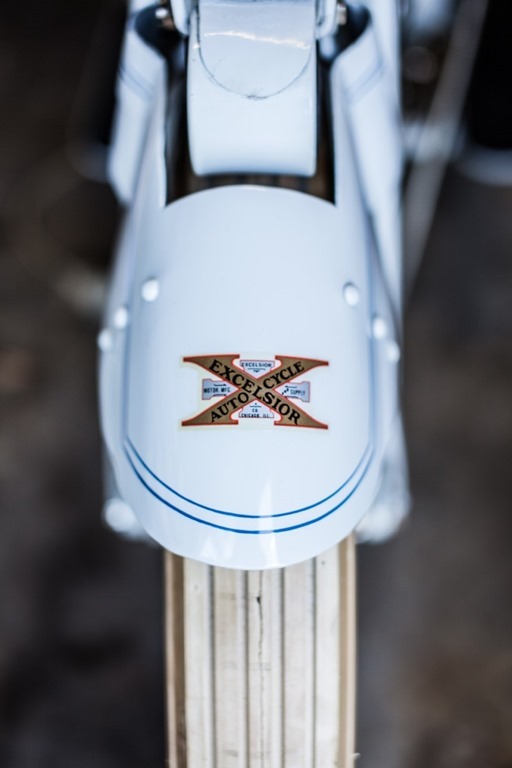 Fortunately Nick Smith sent in these great pics that illustrate just some of the variety of machines that participated, in no particular order. Here is a nice Ariel. 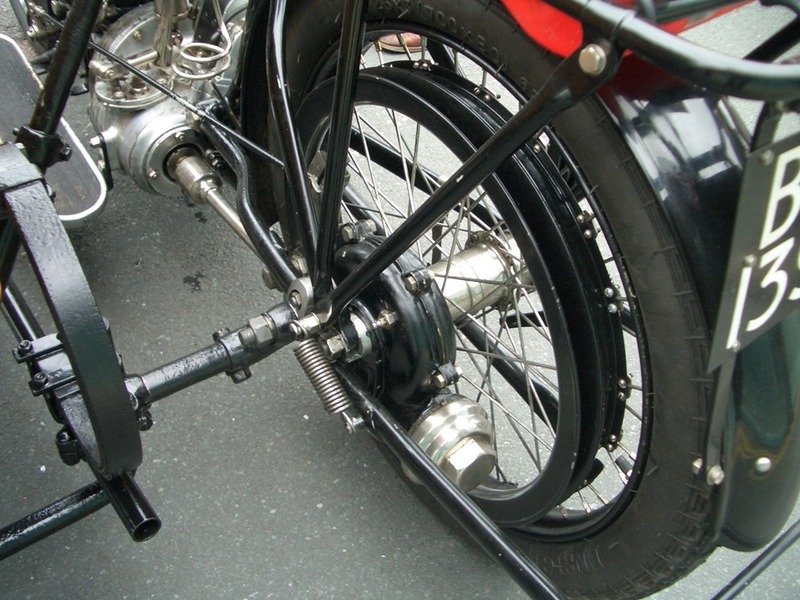 Armstrong 3 speed hub and with the White and Poppe motor that featured the very widely-spaced sidevalves. 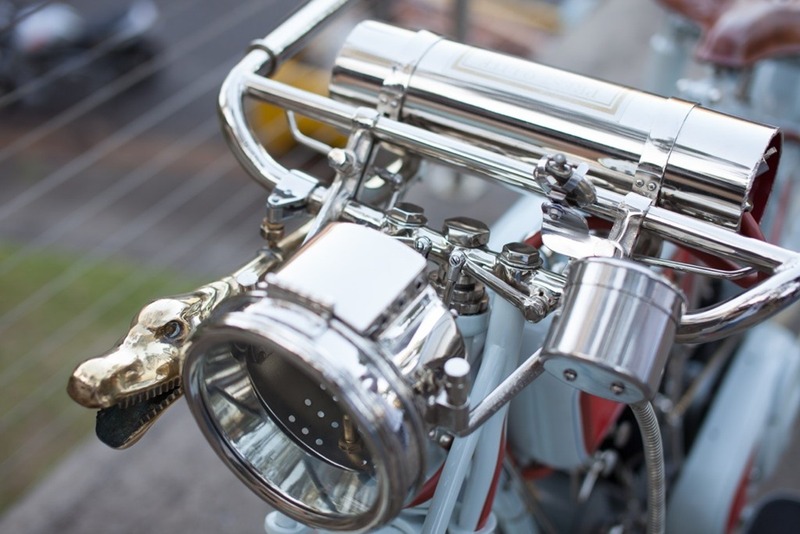 This one also features some racy handlebars. This other (very simliar!) 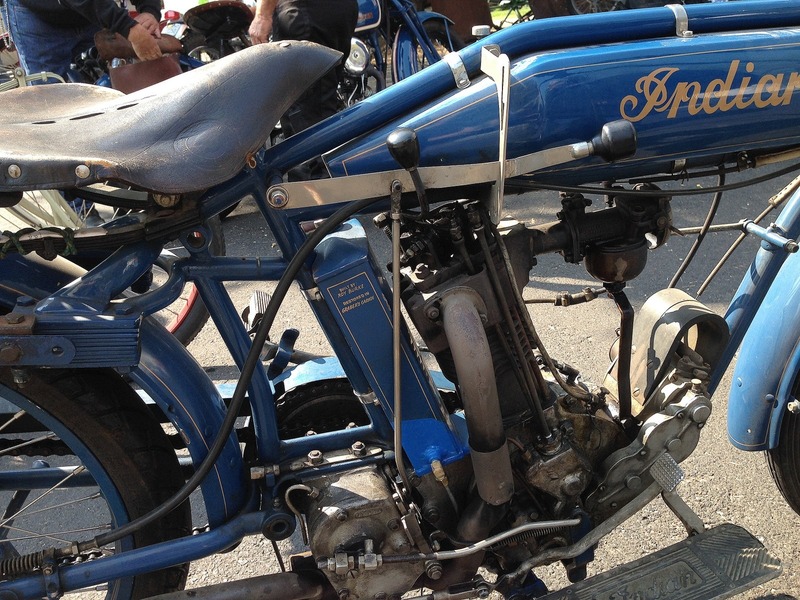 Ariel has the same specification, but also has the springs and linkage under the seat for a smooth ride. 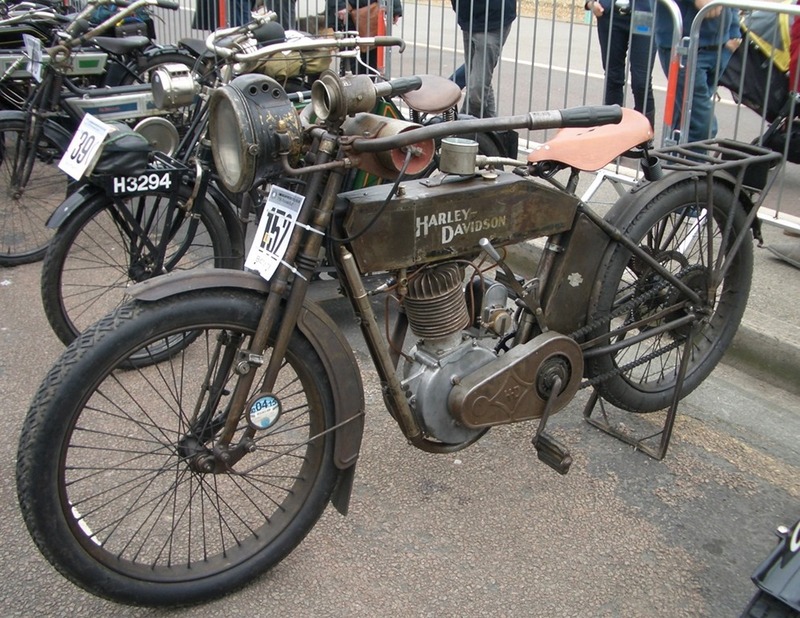 The 1902 Clyde was also on the Anglo Dutch tour last summer. 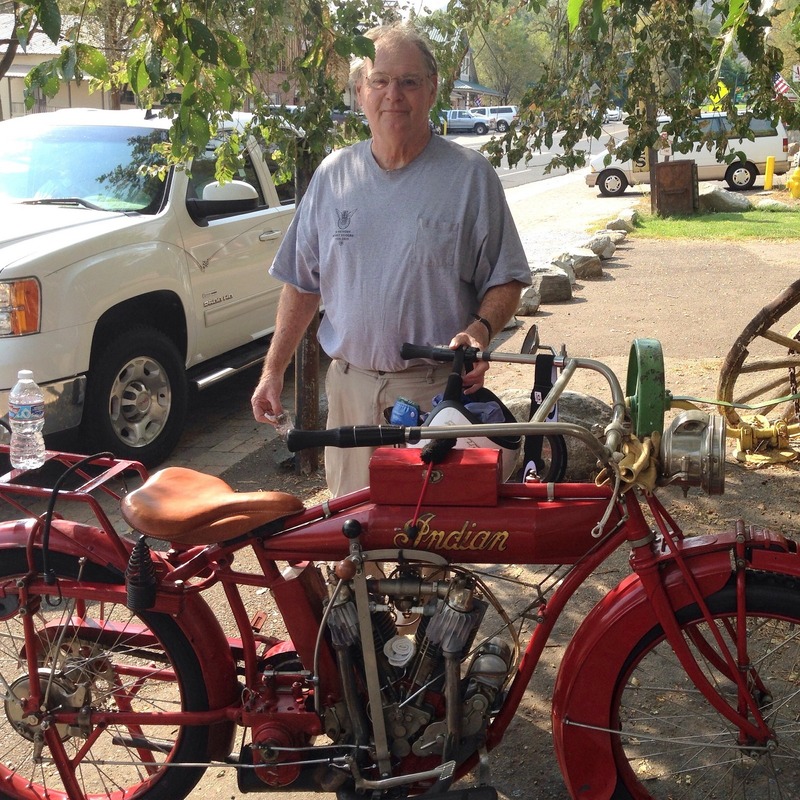 A fine early machine with a Simms motor and a Simms low-tension magneto. The mighty Bosch high-tension mag was still a few years away. What is that? 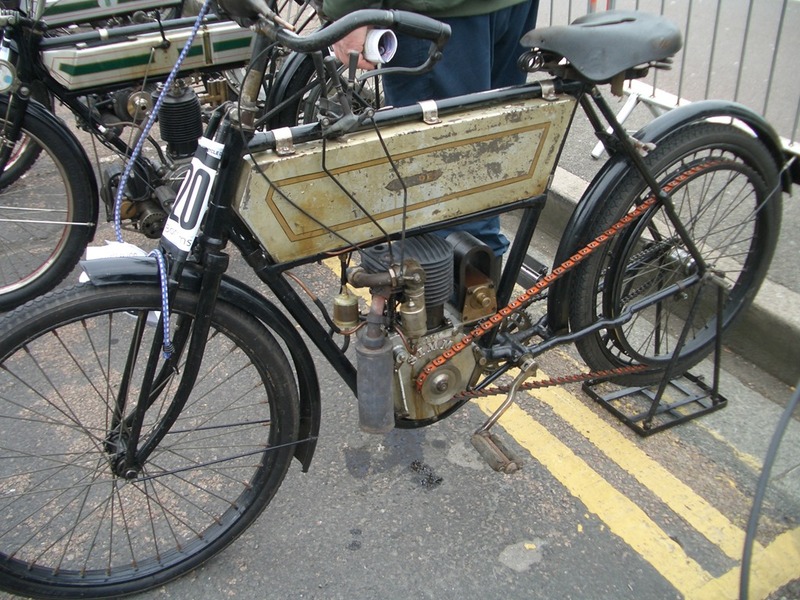 An early Triumph, but with the top frame tube cut down and modified. 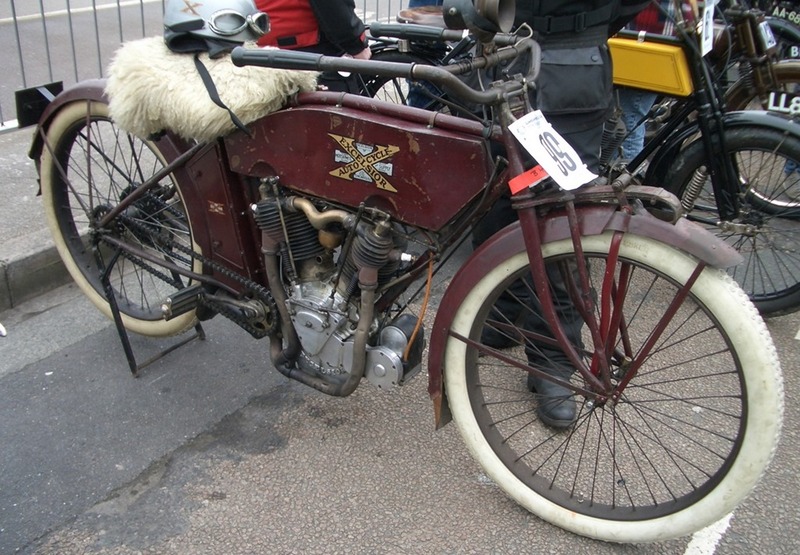 When the style for lower frames came in c1913ish older bikes were modified by owners or even by the factories. The famous James with the Pineapple fins on the cylinders. 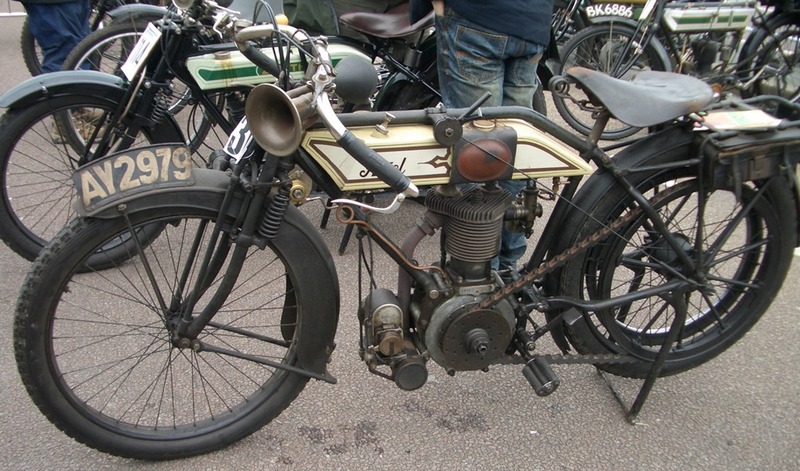 Single cylinders are more common, but here is a Vtwin version. 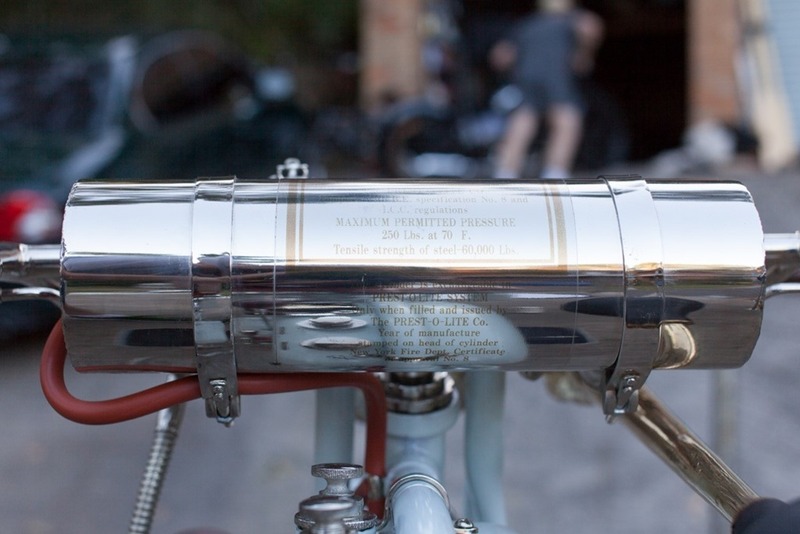 Some neat frame tubes on the Arno! 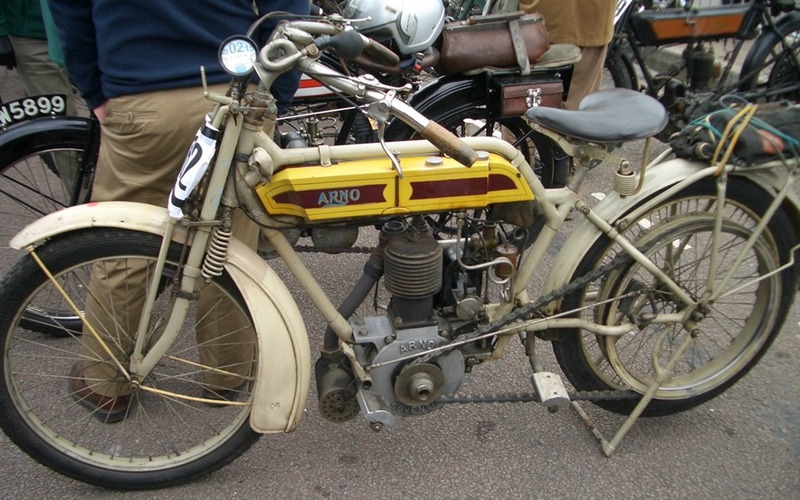 Another Arno with neat frame tubing. 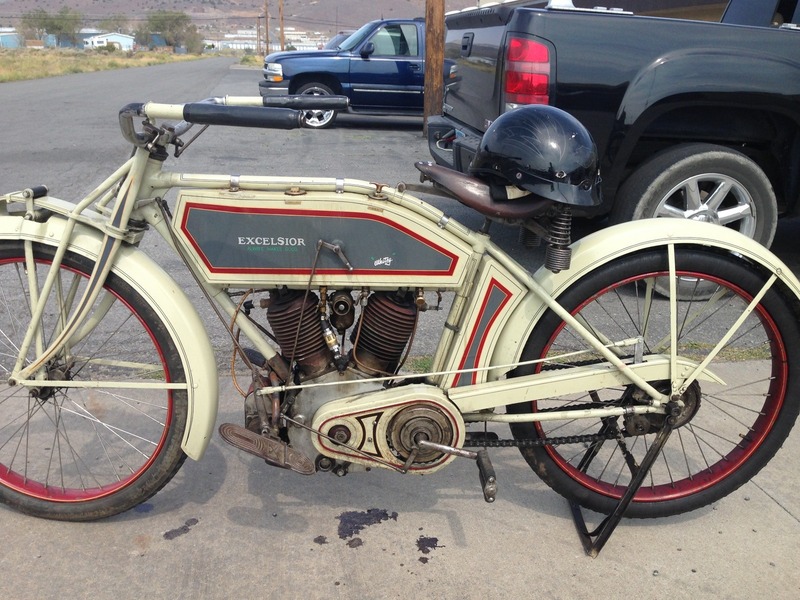 This old 1913 Excelsior looks good in red. 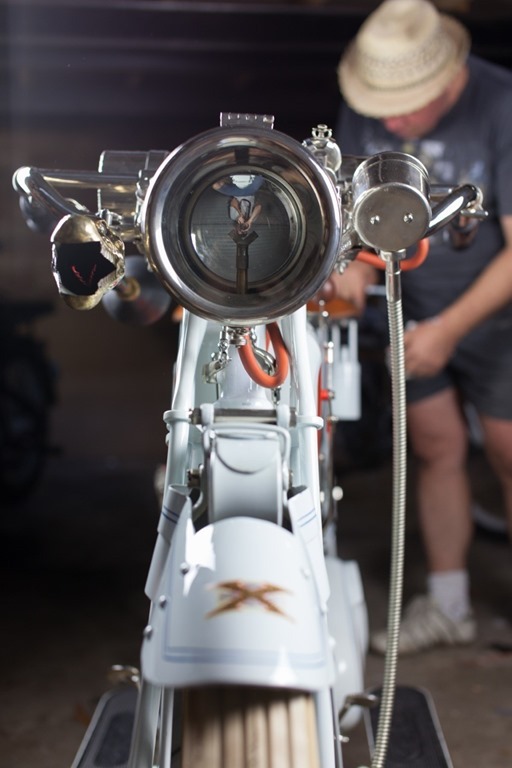 There are a surprising number of American-made machines on the run, including Merkels, X’s and HD’s like this one. A Triumph I think, but the paint is deceiving. 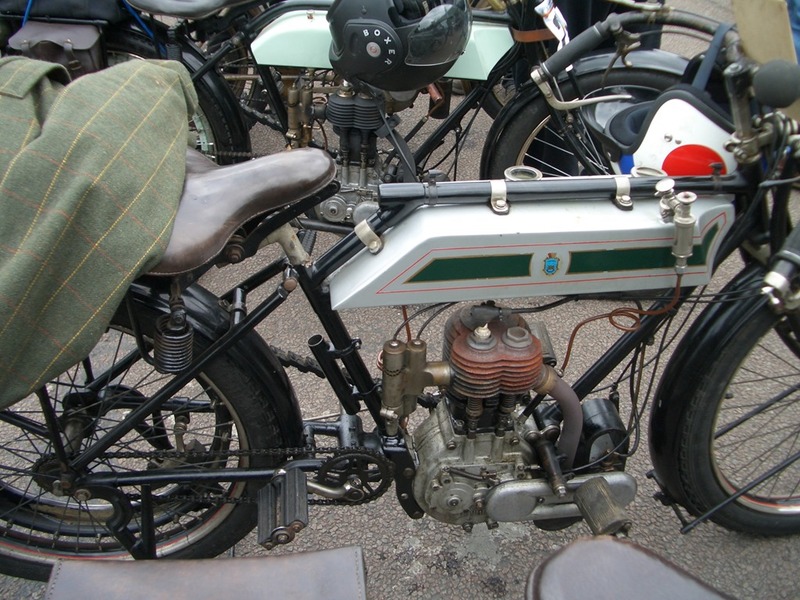 Early AJS with a real gearbox, plus enclosed chains. 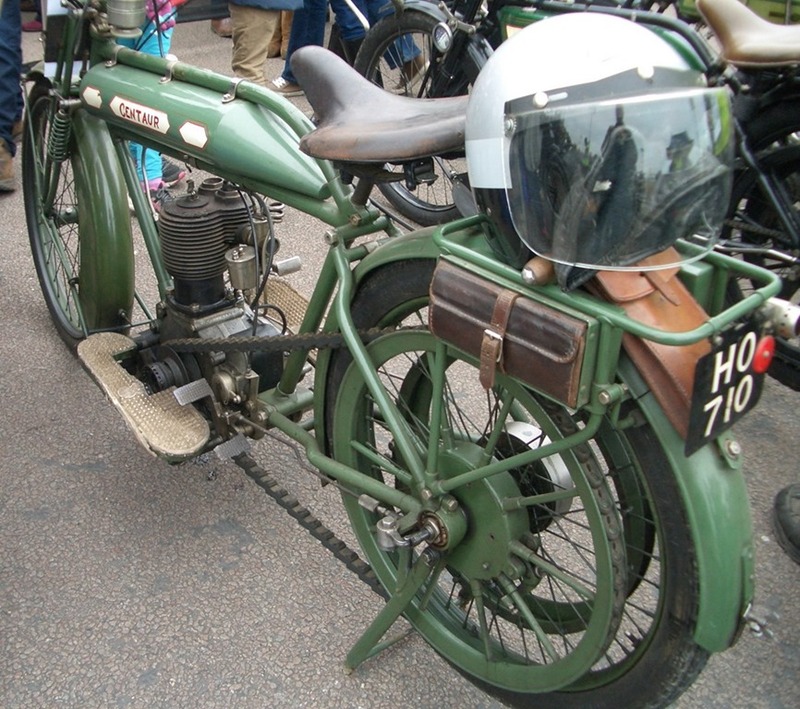 This green Centaur looks much like the other 500 single cylinder bikes, but that rear hub is different. A close look shows the live axle, clutch and the drum brake on the other side. Here is a neat thing, the Stuart Stellar. 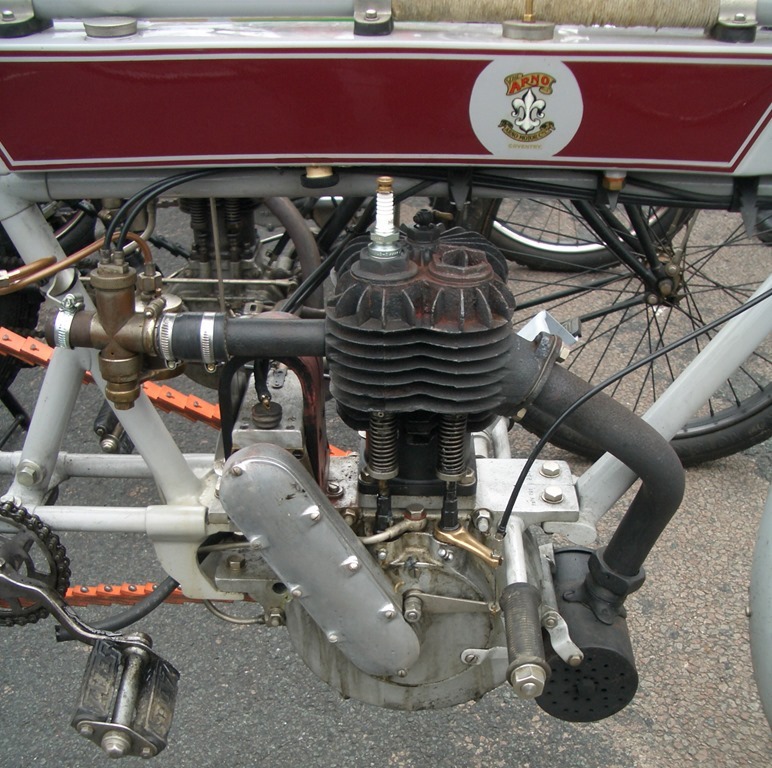 Two cylinders in line, two stroke, water cooled and made before the War. 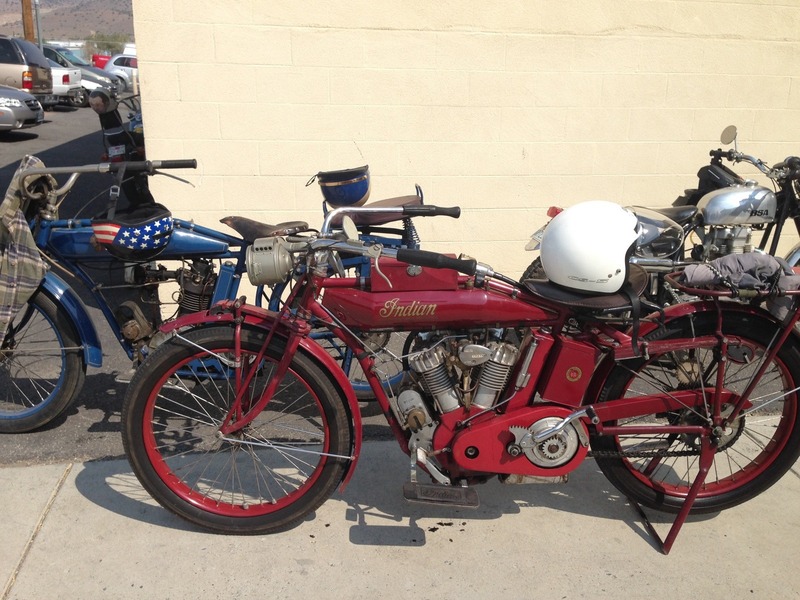 The small bike on the right is a Dayton, also made in the same factory. 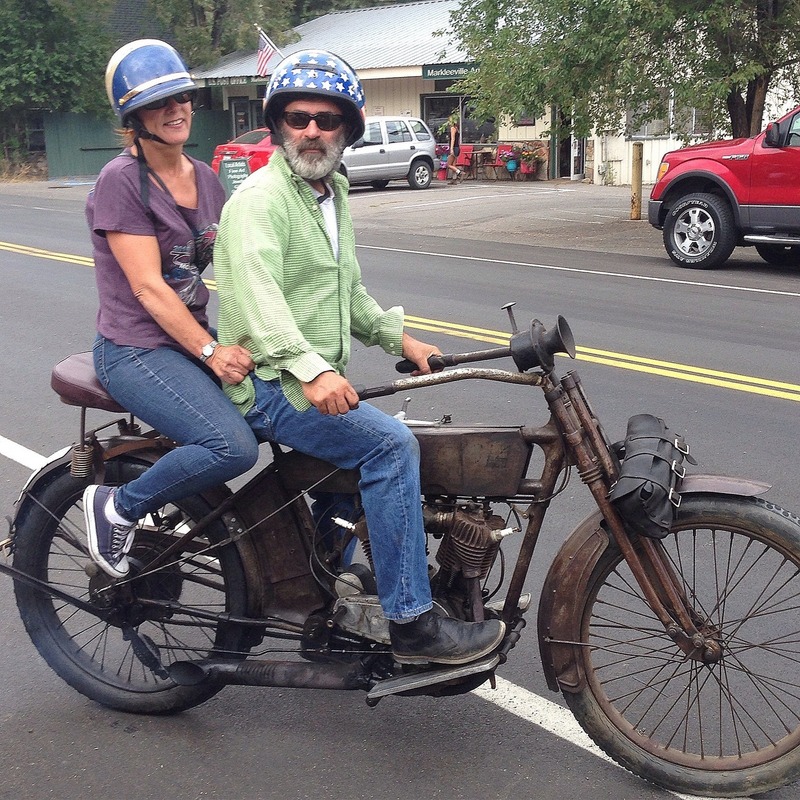 Our good friend Bevars sent in these photos and words from Gary Arps down in New Zealand. 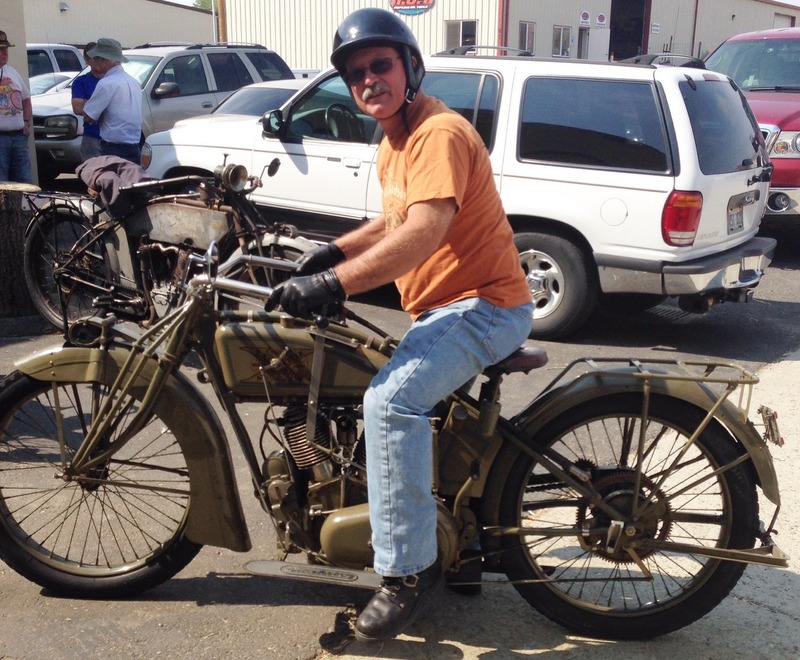 Gary’s document describes some of the very fine restoration work put forth on this machine. But he is now ready to hand it over to a new keeper. The US dollar is doing well these days. Any local buyers interested in repatriating this cycle? Details below. 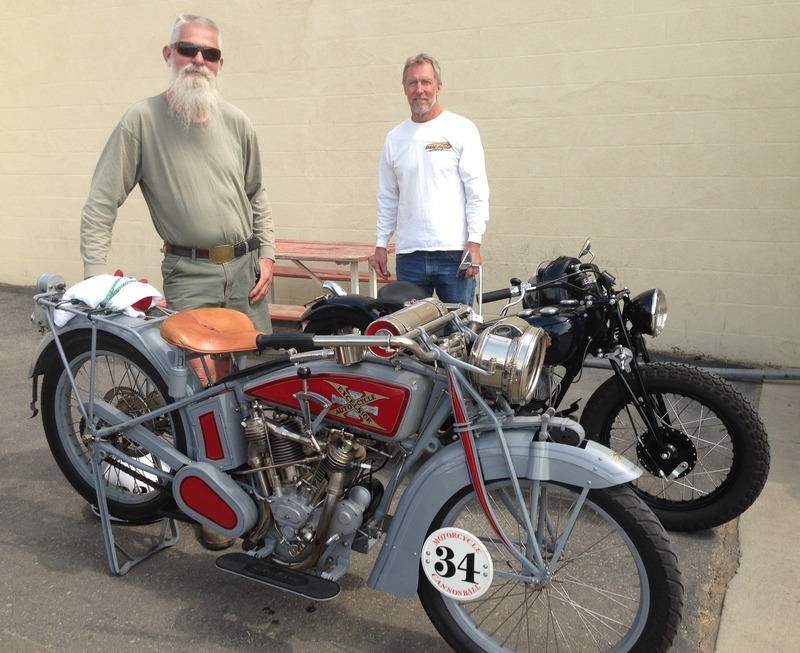 It all started in 1994 at the Ashburton Vintage Car Club swap meet. 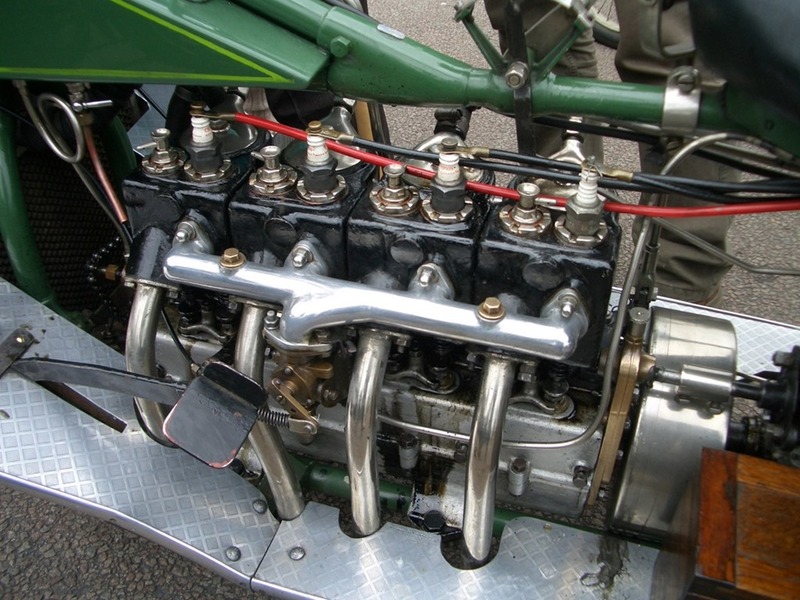 I was minding my site as usual, when a couple of friends told me of ‘a neat old engine’ further back in the paddock. Curious, as usual, I sneaked out to have a look. 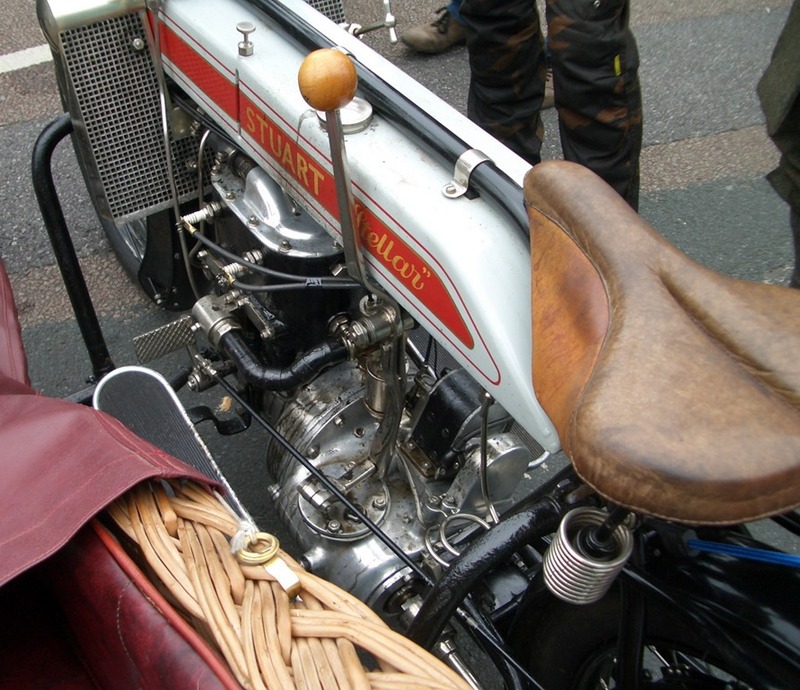 The ‘neat old engine’ was easily identified, with “Merkel Motor Wheel’ clearly showing on the crank case. 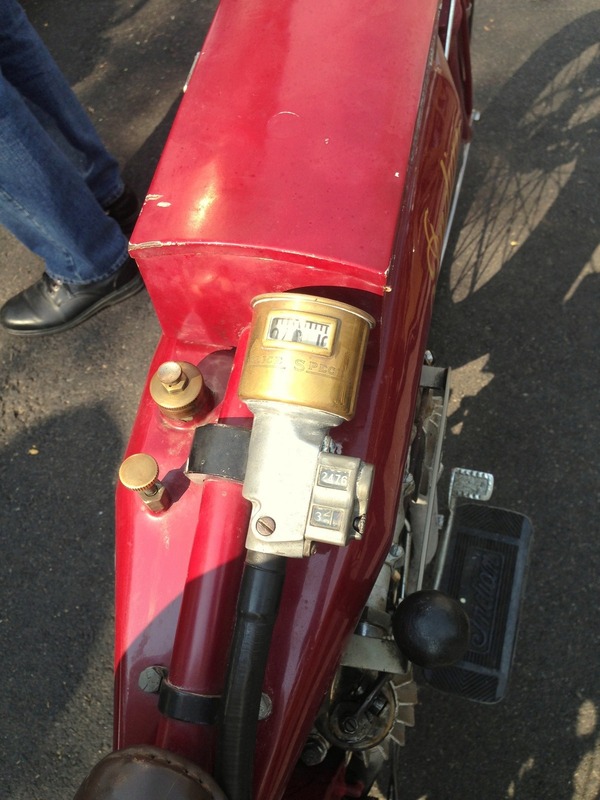 What was on offer was the basic engine; crankcase, barrel etc. with a crankshaft that turned. All in good order, but obviously a lot of parts were missing. 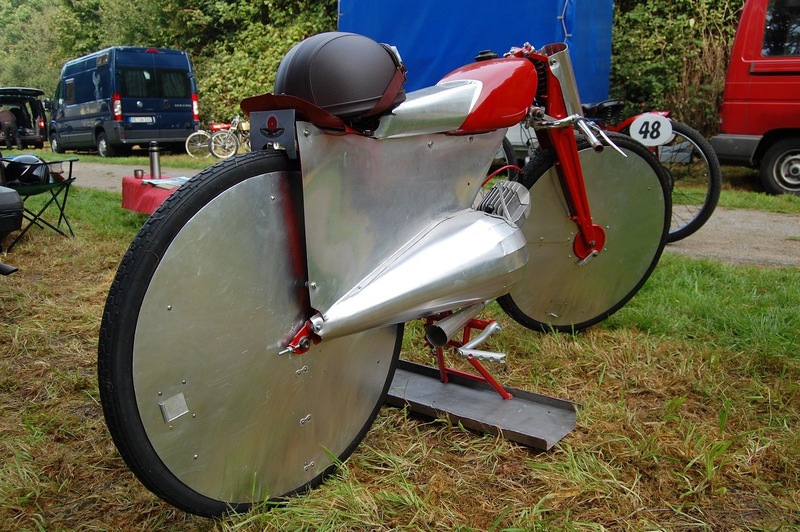 Lots of questions, starting with ‘what on earth is a Merkel Motor Wheel?’, I was aware of the Flying Merkel motorcycles, but had no idea if this was related in any way. Trying to be a bit sensible, I decided to take the vendors ‘phone number, and what information was on the engine, to investigate further. 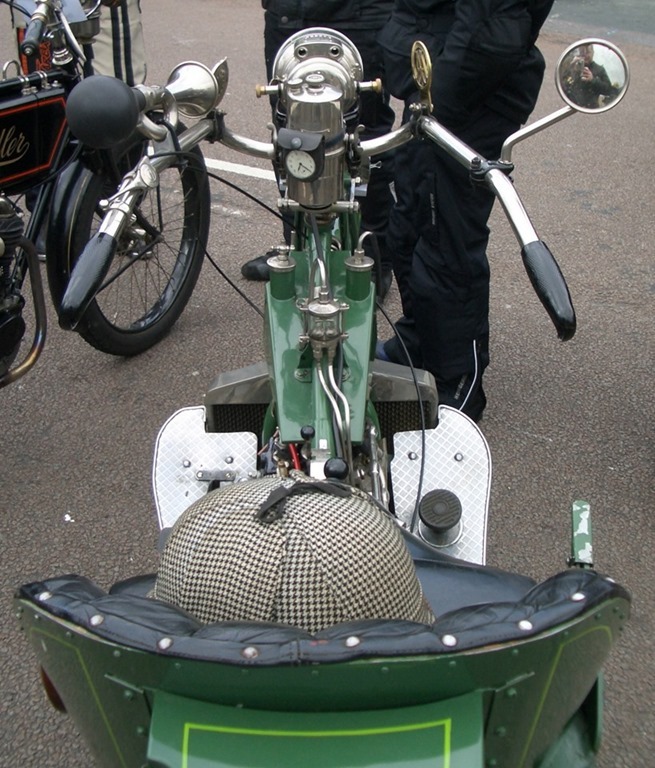 I could find no reference to the Motor Wheel in any of my books, and I have a few!, so next stop was the V.C.C. Canterbury branch library at Cutler Park. I found a set of books from about 1920,with a short article, and three illustrations; left and right views, and a cross section through the motor. 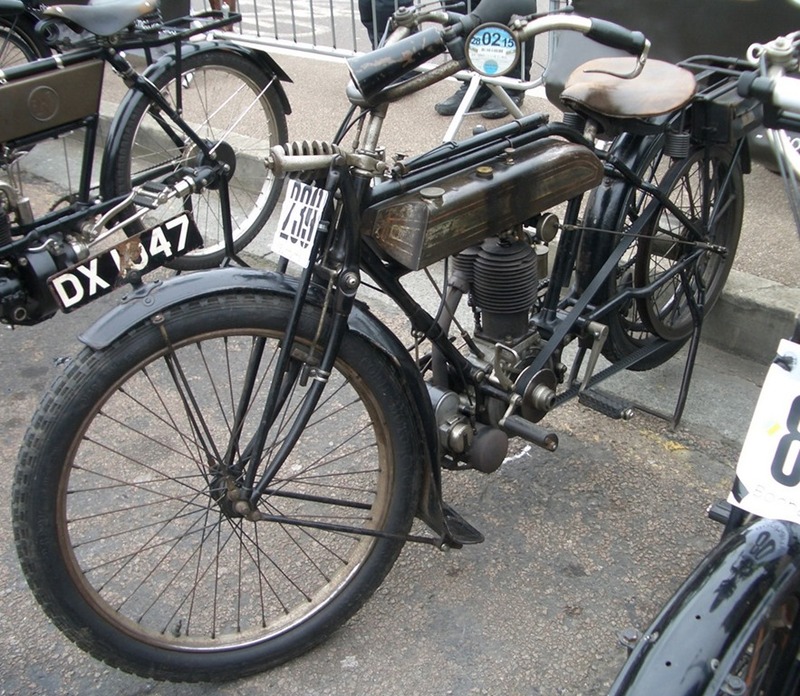 I now knew what the motor was, simply a motor attachment for a bicycle, so there would be no problem finding a frame etc., just an old bike. Surely I could make it work, the metalwork looked complicated, but makeable. I had a lot to learn. The following week I phoned the owner, and arranged to go down to Ashburton to purchase my new toy. I figured that it was unlikely that this was the only unit in N.Z., so started searching for information and parts. I found out about another motor, also incomplete, near Levin, and on a trip north went and introduced myself to Ted, and talked Merkels. Over the next few years, I called on Ted each time I went north. This proved a wee bit frustrating, as Ted was in the early stages of Alzheimer’s, and I had to start again from scratch on each visit. I left my name and phone number tied onto his motor for when the time came to sell, as he had said that he would not build it himself. 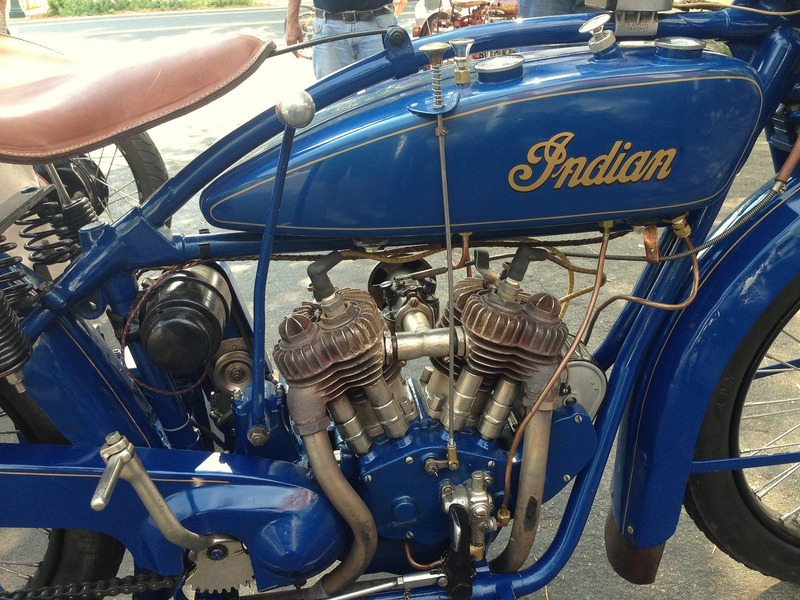 The bottom line was that this motor was not to be mine, another enthusiast made an offer that was accepted. Life can be funny sometimes. I have always maintained that if you know of two, there will be two more that you don’t know about, so I kept on looking. 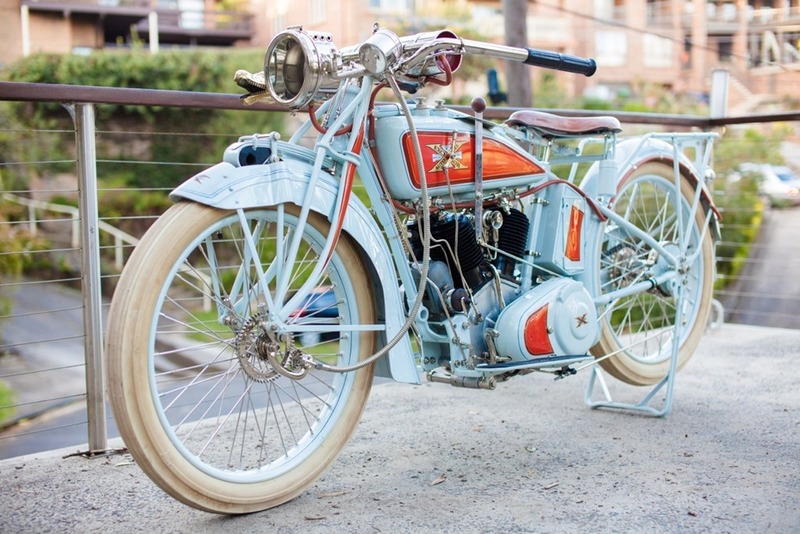 Joe Merkel must have been a busy man, his name is associated with a number of early motorcycle makes, including Light, Merkel-Light, Miami, Flying Merkel, Cleveland, Cyclemotor, and of course , the Merkel Motor Wheel. Joe Merkel was born in Manistee, Michigan, in 1872. At 14 years of age, he was working with a logging railway. Learning machining along with general repair work, created an interest in learning more, and he enrolled at Michigan Agricultural College (now Michigan State University), to study mechanical engineering. After a spell with the E.P.Allis Co, (later Allis Chalmers) Joe opened his own business manufacturing bicycle parts. 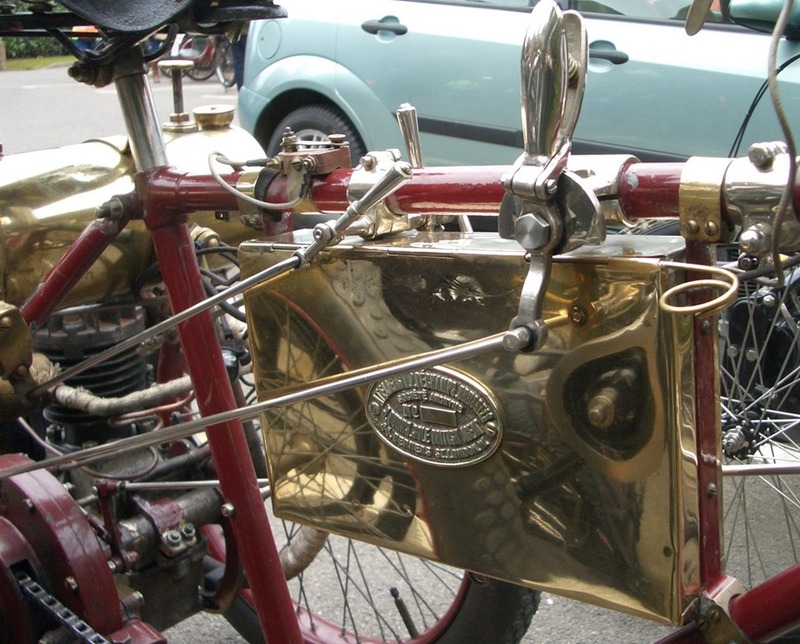 By 1901 Joe was fitting motors to bicycles. 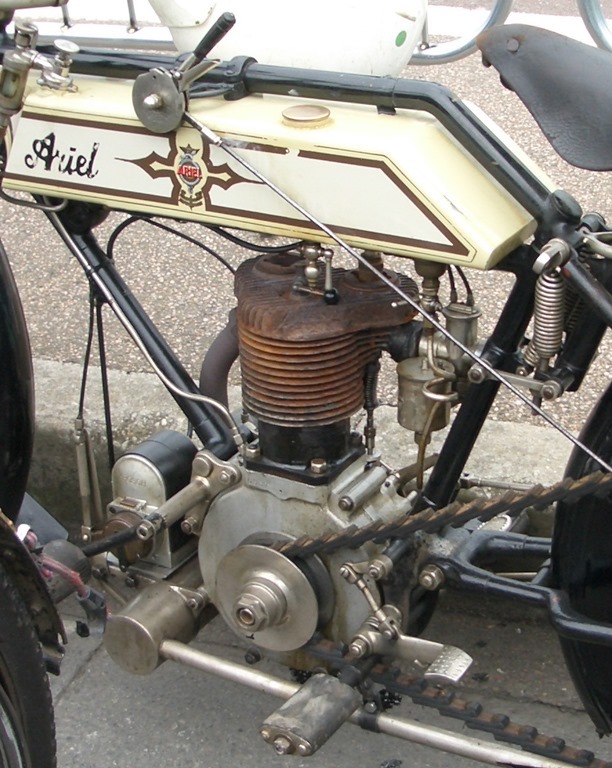 The motor was mounted on the front frame tube, with the usual belt drive. 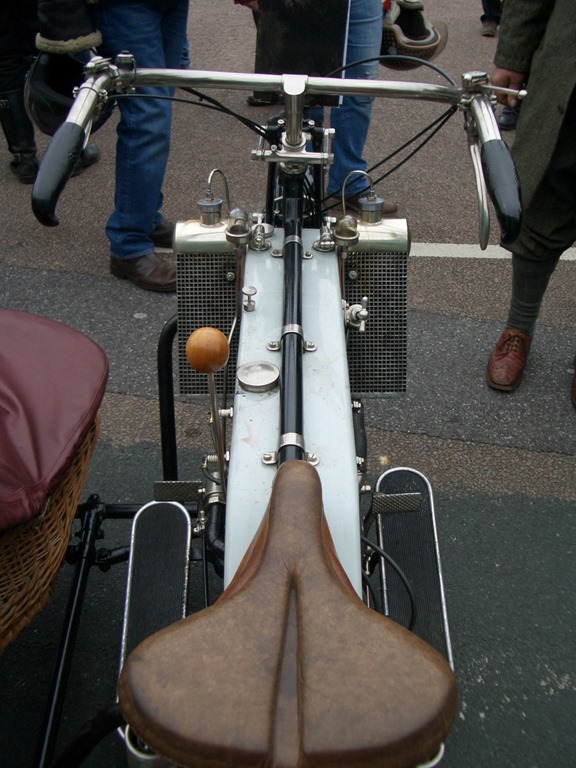 An unusual feature was the exhaust, using the frame tubes; down the front tube and up the seat tube, exiting through drilled holes below the seat. 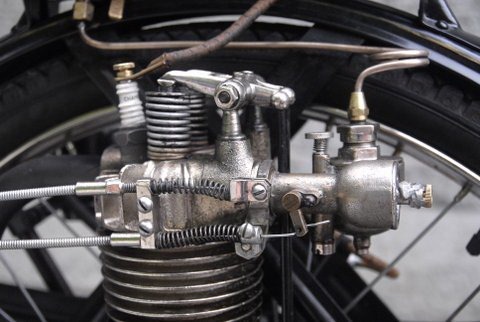 The Merkel was one of the first to use single lever control, with the exhaust valve lifter, and ignition timing both operated from the same lever. 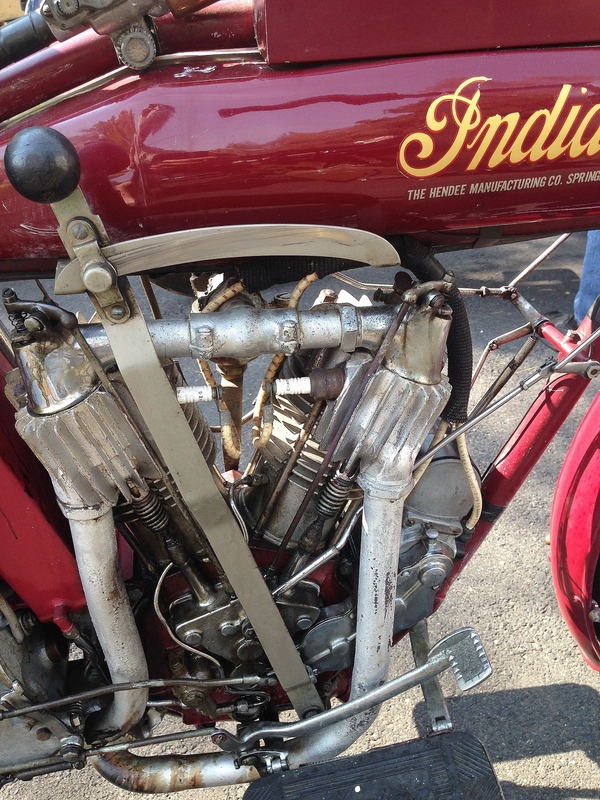 Carburettors of this period did not have ‘throttle’ control, and engine speed was controlled by ignition timing. 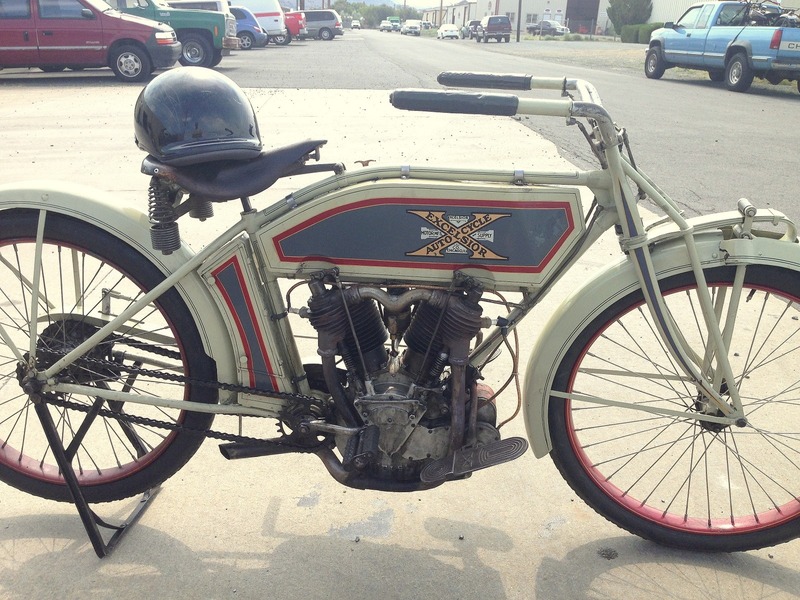 The most famous of Joe Merkel’s designs was the “Flying Merkel” made around 1909-1915. 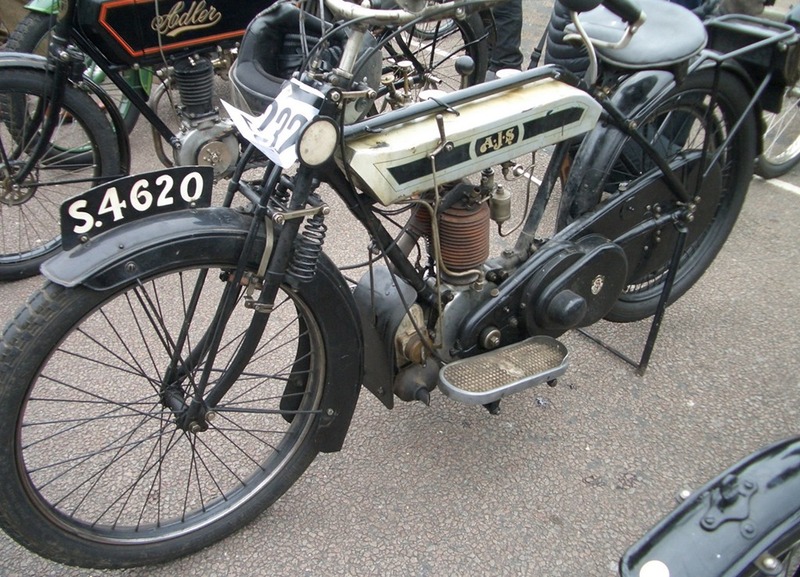 These were a range of singles and V twins, which showed a lot of innovation, sprung frames, using a spring below the seat, a system later used by Vincent, then Yamaha, then everybody. 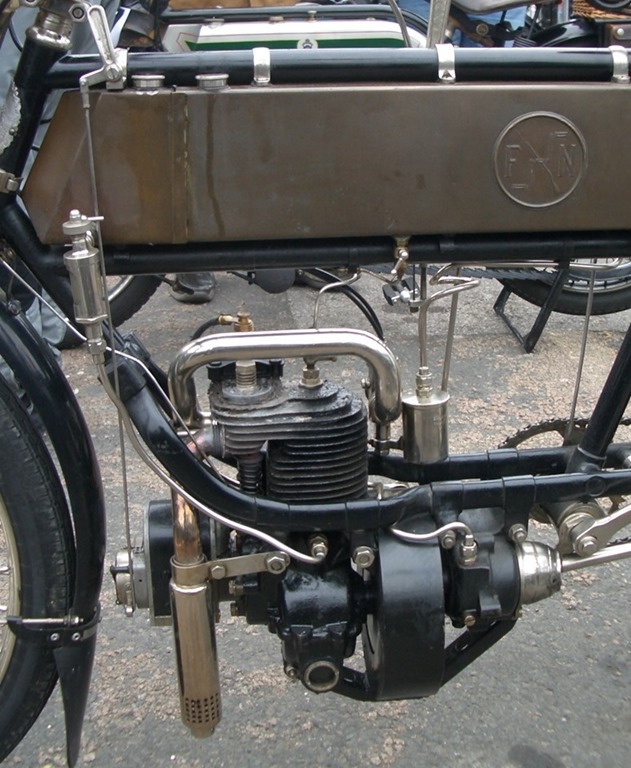 Front forks looked like a conventional girder, but were telescopic in principle. These were the “hot” item for racers through the next decade. 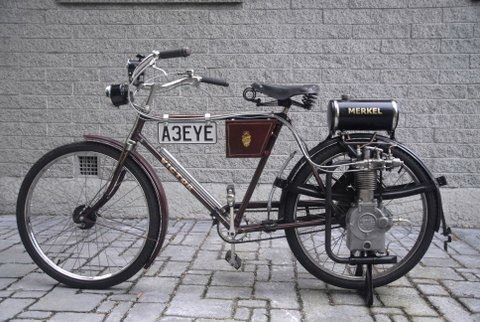 Some models had an early attempt at electric start, but battery technology had not yet made this a successful idea. Most of the Merkel companies appeared to have good designs and products for the times, but all seemed to run into financial hard times. Possibly a case of a brilliant designer / engineer , but not such a good businessman. As each company failed, another arose. For ‘re-organised’, read ‘new investors’. 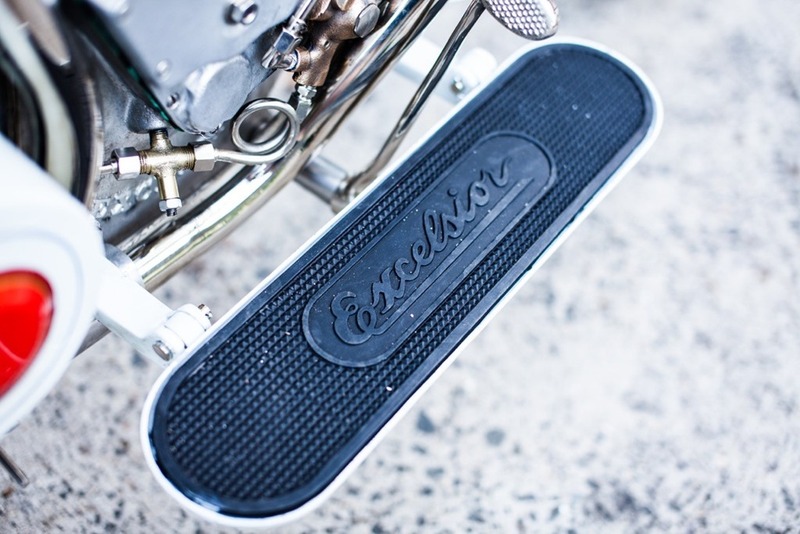 After parting from Flying Merkel, Joe went on to design the Merkel Motor Wheel. Announced at the Cycle Trades Association convention in Atlantic City, December 4th 1916. 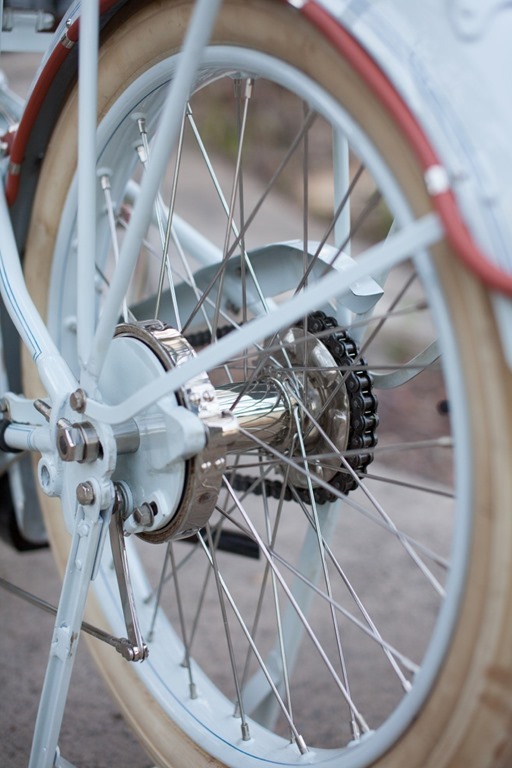 The wheel was sold as a kit to convert your bicycle to a motorcycle for $80. 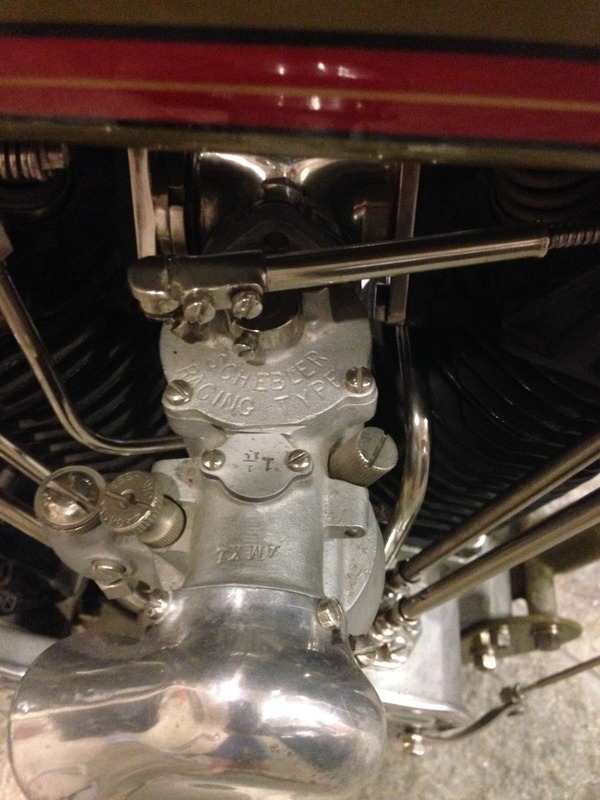 The Motor Wheel was a four stroke, over head valve unit with 2 1/2” bore and stroke. 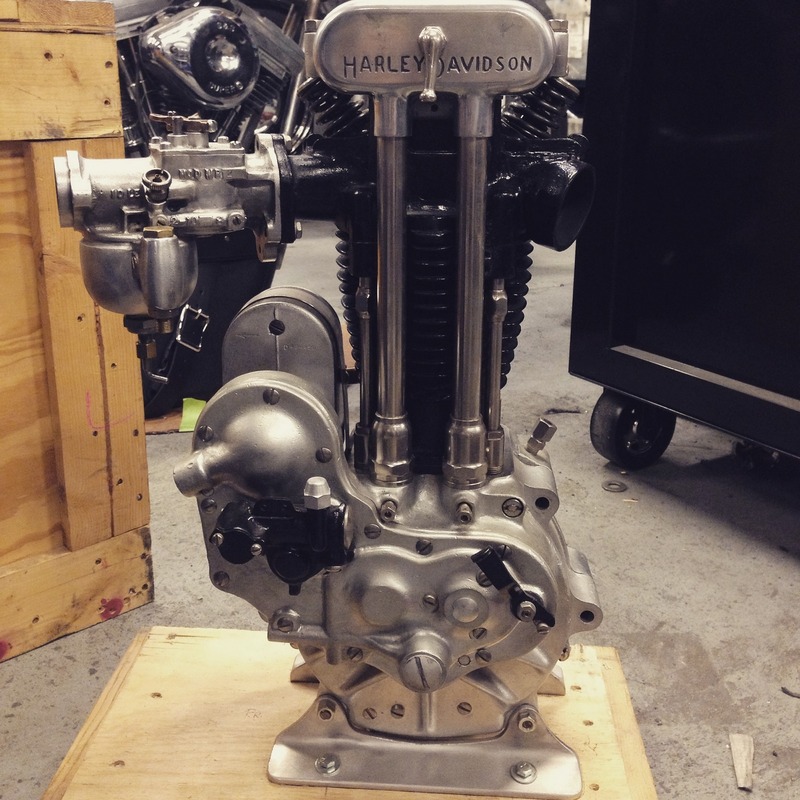 Just under 10 cubic inches, or about 200cc. The overall design was very neat and compact, and very clever in the way it was put together. 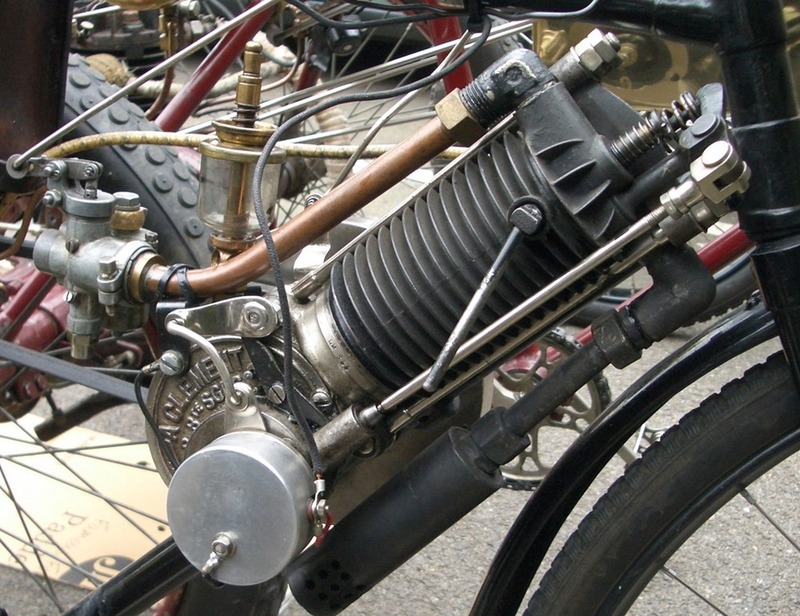 The camshaft operated at quarter speed, with two lobes for each valve, and a gear on the end of the shaft drove the wheel. The overhung crankshaft extended right through the wheel hub, to carry a flywheel magneto on the other side of the wheel. This ‘first generation’ flywheel mag was to cause much grief during restoration. 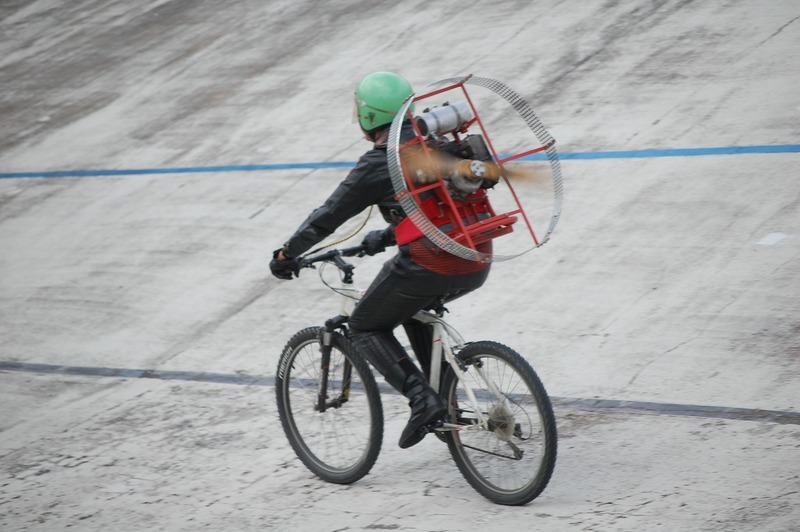 It was claimed the the motor wheel could be installed in your bicycle in 20 minutes, a couple of hours, more likely. After a year and a half, the company declared bankruptcy, the main creditor being Hendee Manufacturing (Indian) who had manufactured parts on contract. 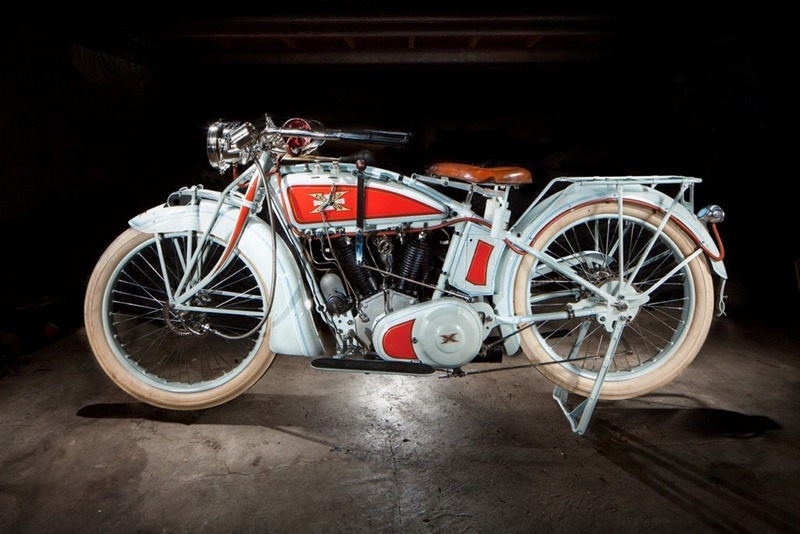 In the auction of assets that followed, Hendee outbid Joe Merkel, and went on to modify the remaining motors by adding a clutch, so the rider could stop the bike and keep the engine running. 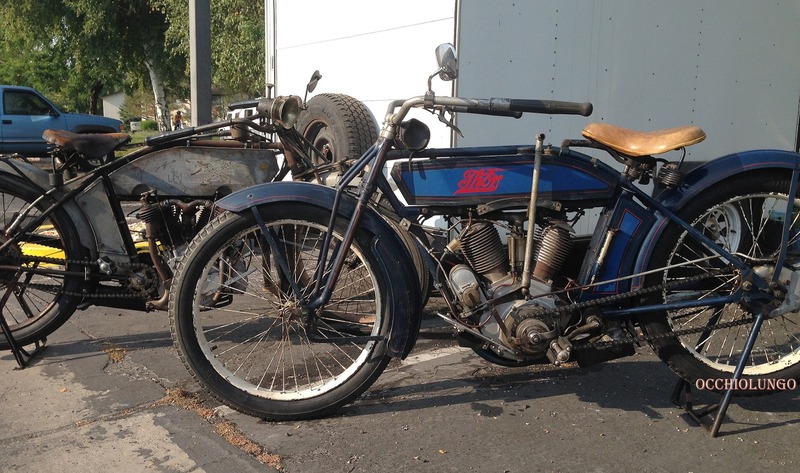 These were sold off during 1922. It appears that around 2000 were sold in total, nothing like the 5000 Merkel contracted for. In the meantime I had found out that the missing bits were just a little difficult to create without more information. 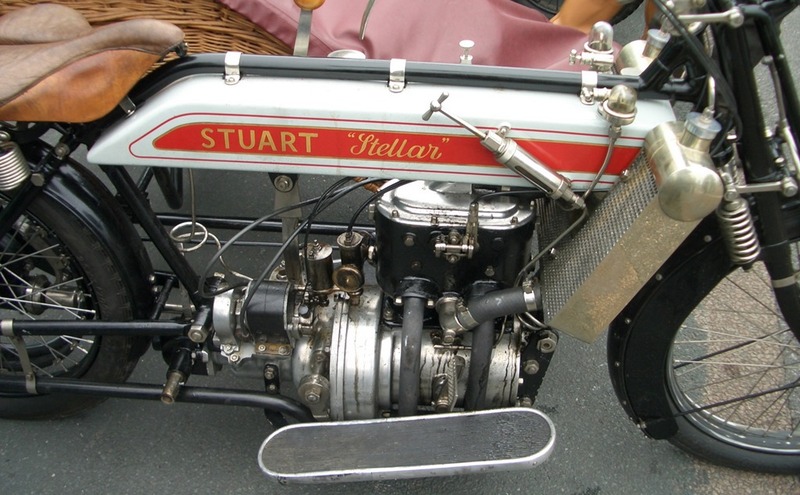 The Internet had provided several pictures, and multiple copies of early adverts, but nothing of any detail, and nothing about the engine internals. The cross section drawing from that old engineering book was the only internal information to appear anywhere. Luckily the drawing was clear enough to photo enlarge to A3 size, this helped answer some questions. Much later I found a link to the U.K. patent application which provided a few more drawings. 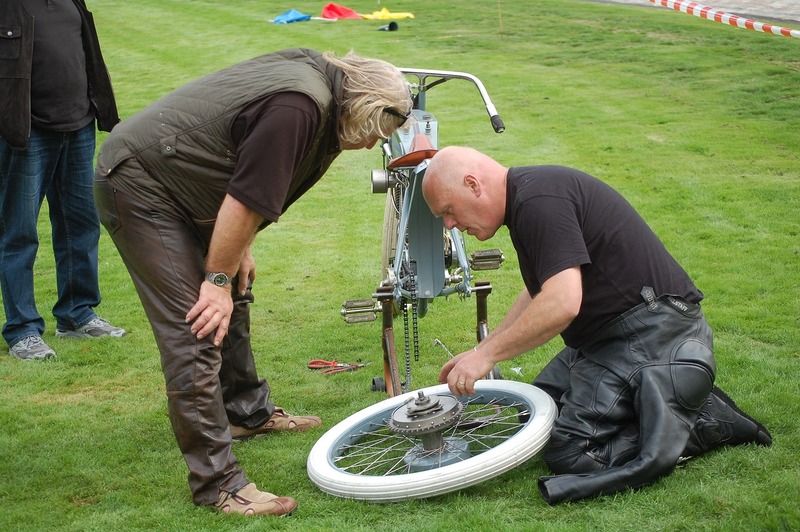 A complete wheel assembly appeared on Ebay, obviously stored for years, with the tyre almost rotting off it. I got real keen until the price went way past what I was prepared, or able, to spend. At least I saved the photos. 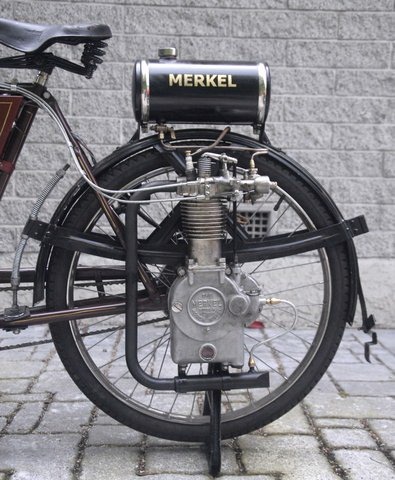 After about 12 years, I consulted Dr. Google again on a dead telly night, typed in ‘Merkel Motor Wheel’ as I had done many times, and linked straight through to Ebay where an incomplete motor was for sale. 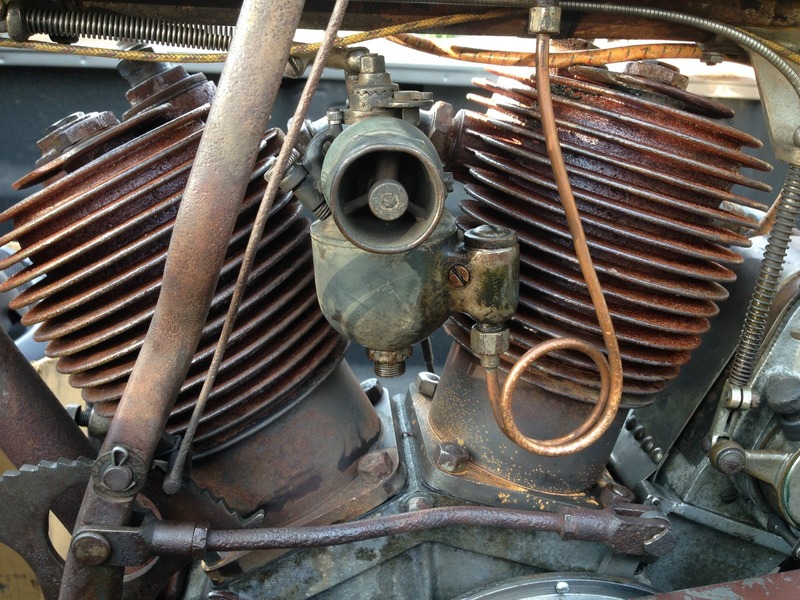 This motor had magneto, carburettor, and hub, all parts I needed. The unit had just been listed, so I had a week or so to wait, so I decided not to show my hand, just watch and wait and see what happens. I loaded an auto bid for all I was prepared to spend, and pushed the go button right on the last minute of bidding. The computer sort of went mad, with messages to and fro, but two minutes later it was confirmed, I had won, and better, it did not go to the limit. Next problem was to get the motor home from Pennsylvania. As the motor looked a bit large for the post, I checked with a friend who regularly sources parts from the USA, for suggestions. I was in luck, Eddie had a container being packed in the US, and if We could get the motor to California in two weeks, it could be included. Just had to make sure all the paperwork was up to the mark for customs clearance etc. 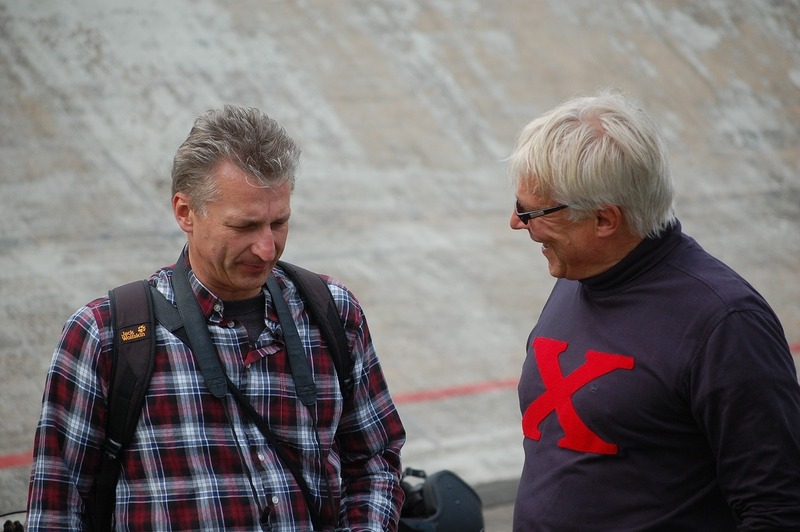 Everything went according to plan, and on the first working day of 2008, I got the call, my box had arrived. I now had two incomplete motors, so the next step was to build one unit up as a sort of stock take of what I did or did not have. 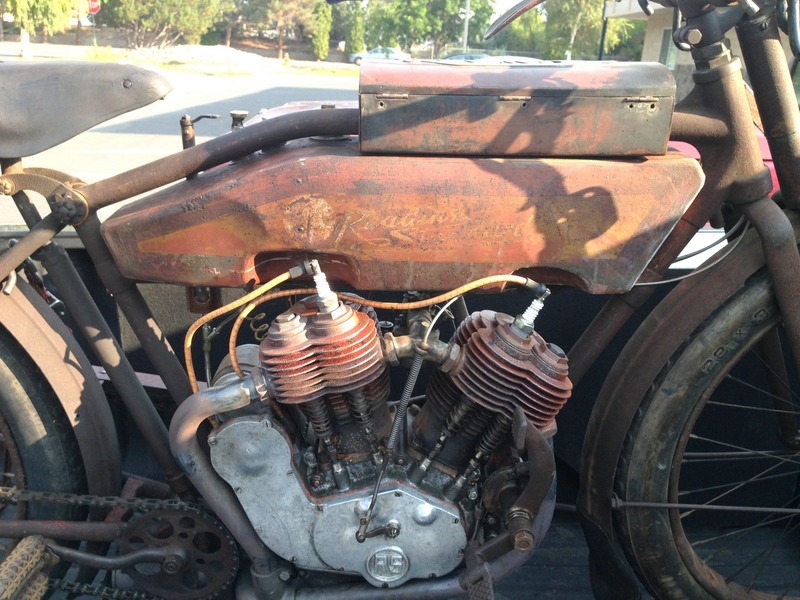 Items missing were the hub internals, ignition coil, breaker points and condenser. 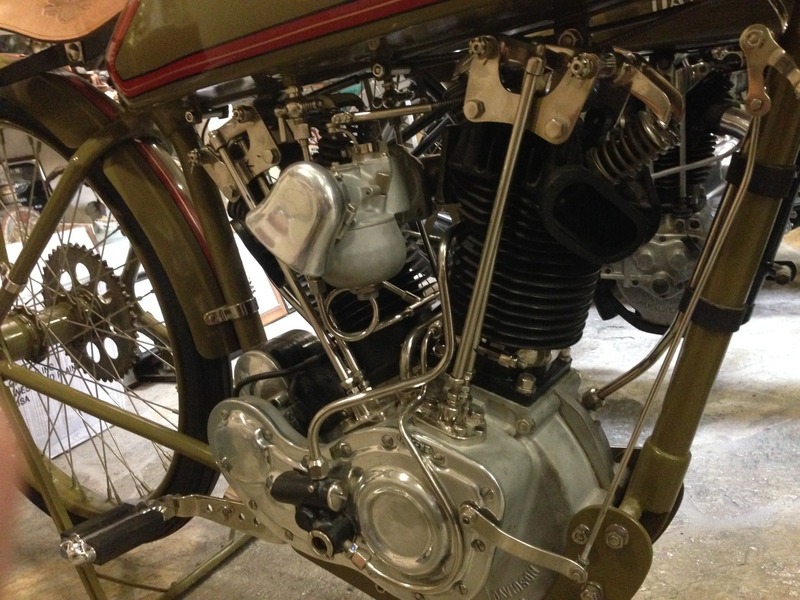 This was still only the bare motor unit, but the whole project now looked much more achievable. What next? If I could adapt some contact breaker points for the ignition, it might be possible to make the engine run. I found a cam on the inside of the magneto flywheel, located top dead centre, and worked out where the contact set should approximately sit on the back plate. Then with a stack of ignition parts catalogues, I tried to find something that looked adaptable. I had no idea what the original would have looked like. Nearest thing I could find was back to front, so I cut it apart shuffled the pieces around, and welded back together. I then created a mounting plate for the contacts and a suitable condenser A fiddly and time consuming job for something so small, but now I had something that might work. 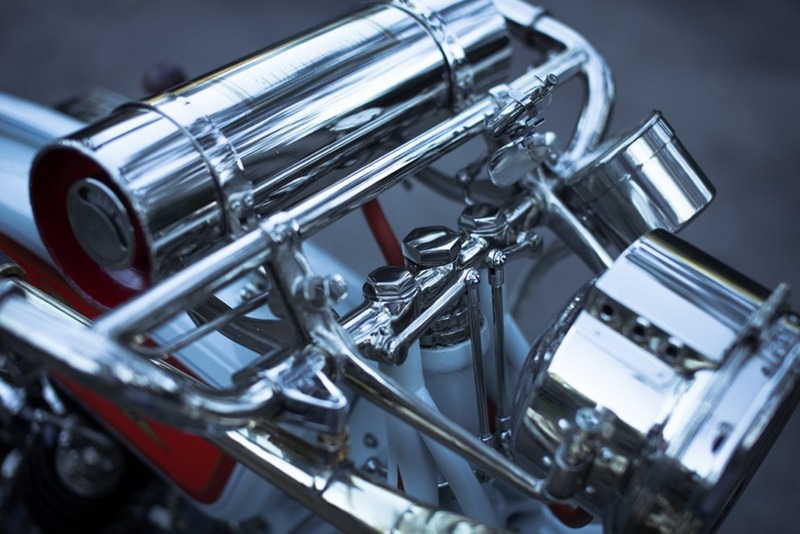 A piece of steel girder was adapted as an engine mount, a 12volt car coil and battery connected up, engine filled with oil, and some petrol for the carburettor, so would it run? With a socket attached to the chuck of a ½ inch drill I was able to drive the motor by the magneto flywheel nut. A bit of messing around with carb settings, and it ran! Not well, but running is running. The garage was full of noise, smoke and smiles. It was time to make the Merkel happen. The first problem was the hub internals. 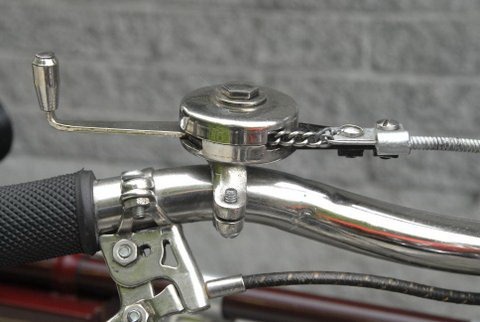 This is a bicycle style back pedal brake, made by Eclipse, where a stack of metal plates is used for the brake, a bit like a clutch in its action. 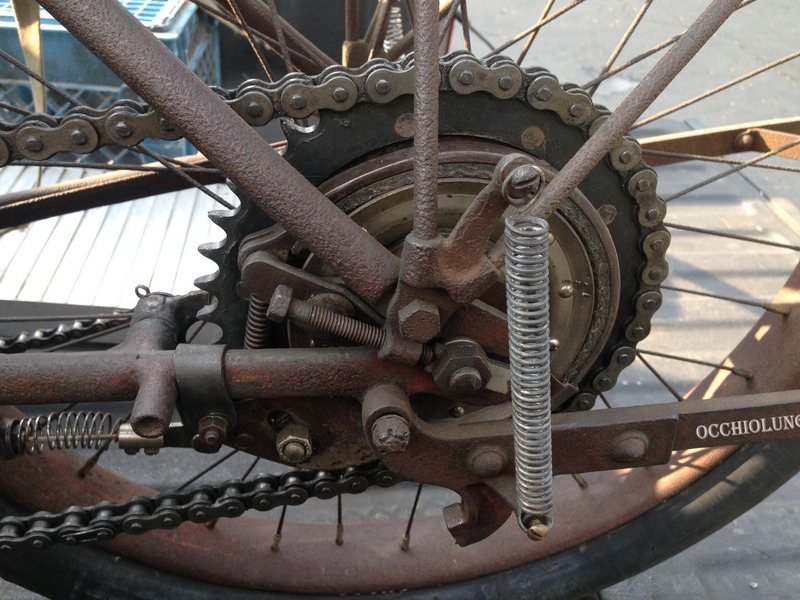 The plates were missing, as was a large “nut” that fitted over the sprocket carrier on a coarse three start thread, similar to a starter bendix drive. 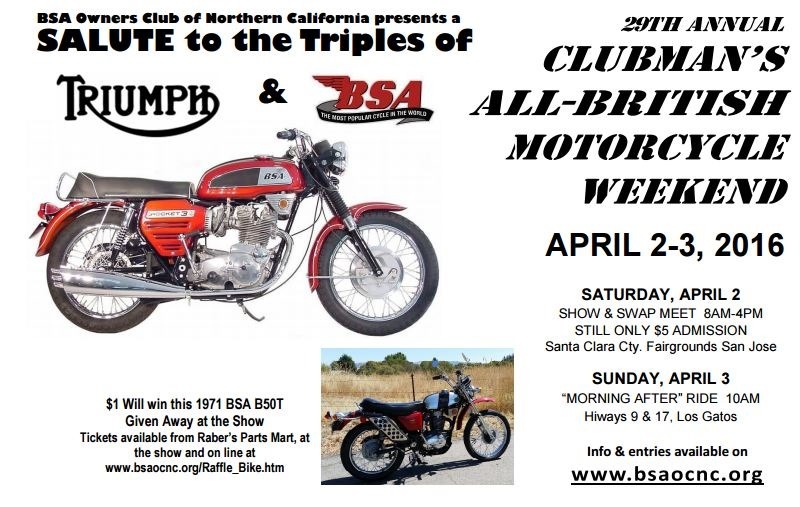 So off to see a couple of club members, Barry and Don, in search of suggestions or advice. After getting their heads around the problem, and a bit of discussion, Barry said to leave it with him. I think the challenge was the thing. A few days later, the job was done. The brake plates were a lot easier, a simple laser cutting job. 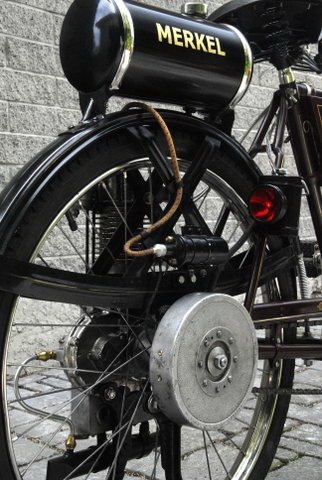 A period picture of the Motor Wheel assembly was photo enlarged to actual size, and used as a pattern for the curves on the engine support frame, more laser cutting. 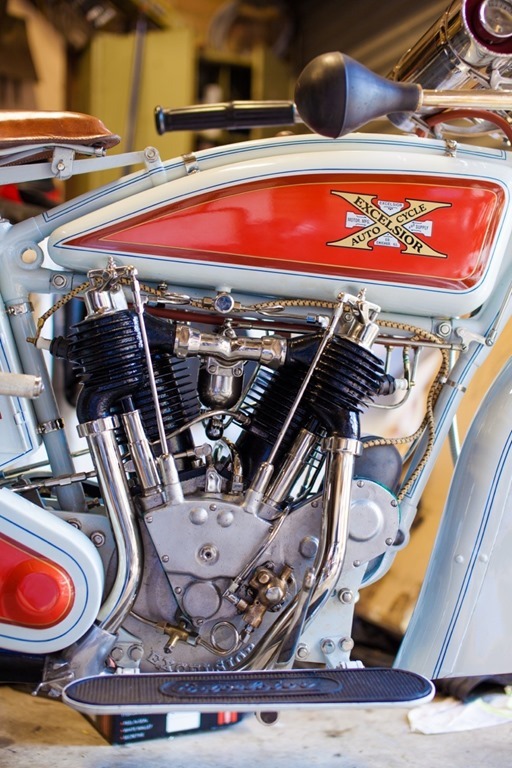 All of the frame, bracketry, the tank, and all sorts of little bits had to be made from the details in old fuzzy pictures. 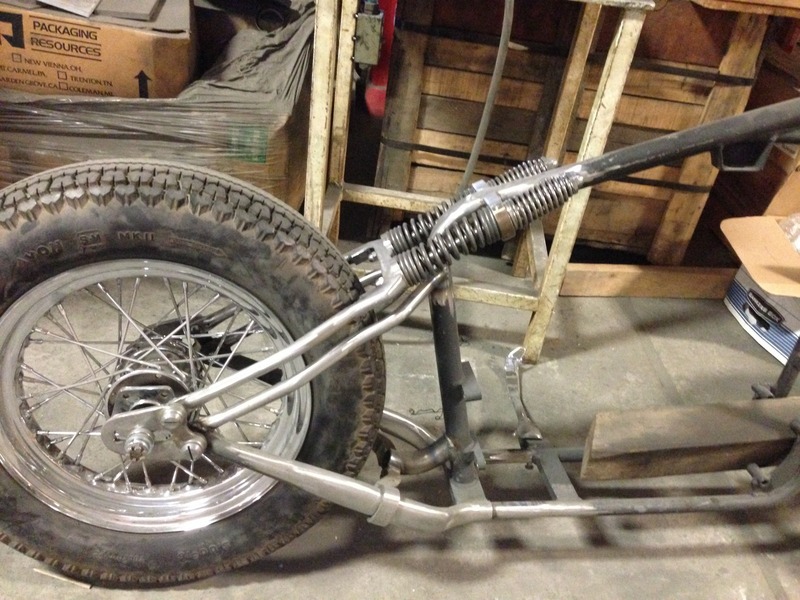 The throttle control lever assembly was a challenge, it used a chain around the drum to pull a wire. I had a picture, which I enlarged to near enough actual size, then scaled from the handlebar diameter to get measurements. A dozen or so small parts took a lot of time, but I am very pleased with the finished assembly. 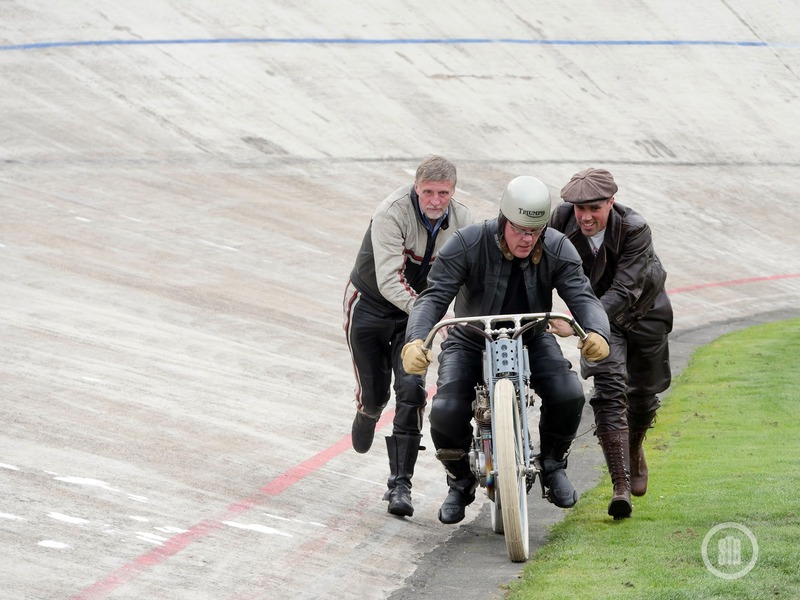 Engine bearings were easy, being modern, standard, metric sized ball races. 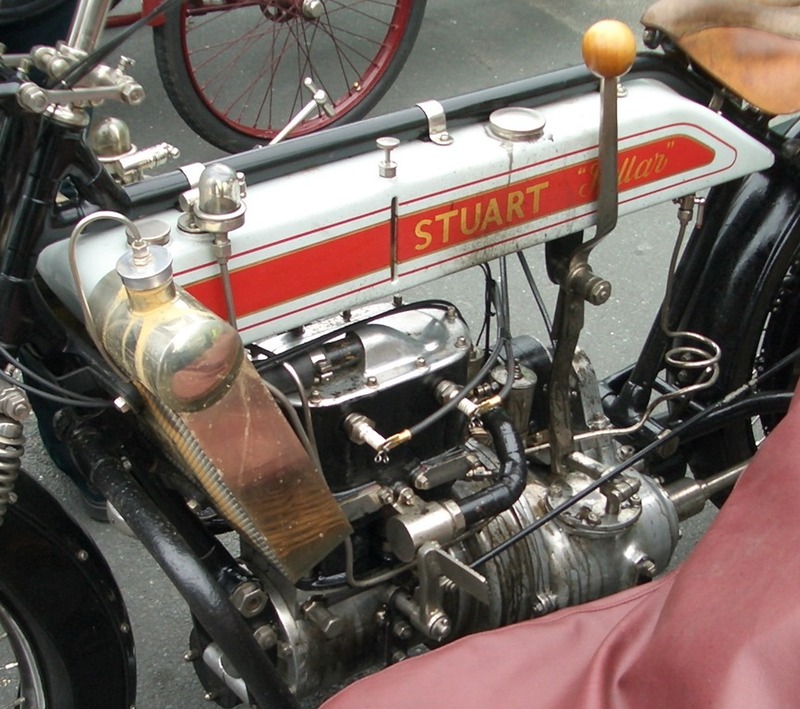 Reading many early accounts of vintage motoring, it becomes obvious very quickly that valves were a real problem, way back then, with many riders carrying spares to fit on the side of the road. The materials of the day were just not up to the job, so I opted to get new valves made. While talking to George about valves, I checked on my options about what to do with the old cast iron piston. With a bit of thinking, and consultation in a few books, it turned out that Ford 10 was just about right for the job, and much lighter, an advantage in a motor that isn’t really balanced. 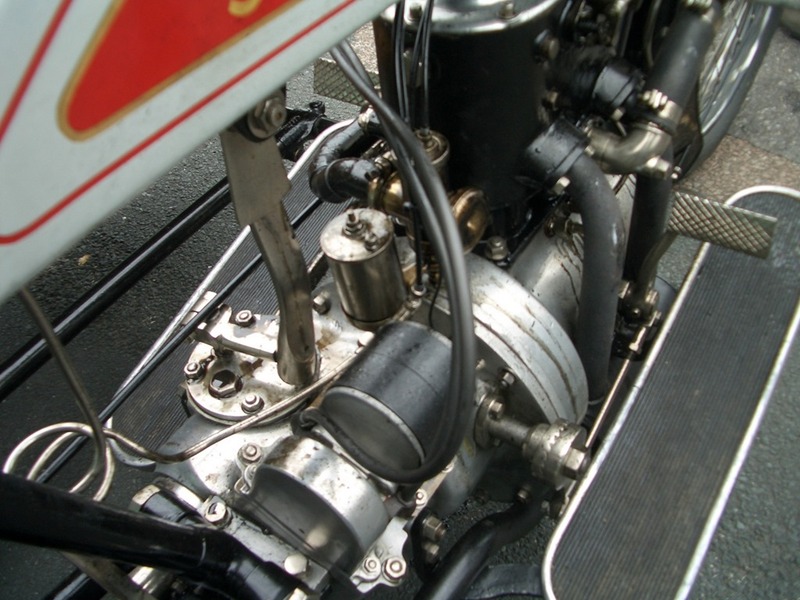 Rather than bore the cylinder, it was decided to size a piston to suit. While waiting for the machine work, it was time to look at the magneto. 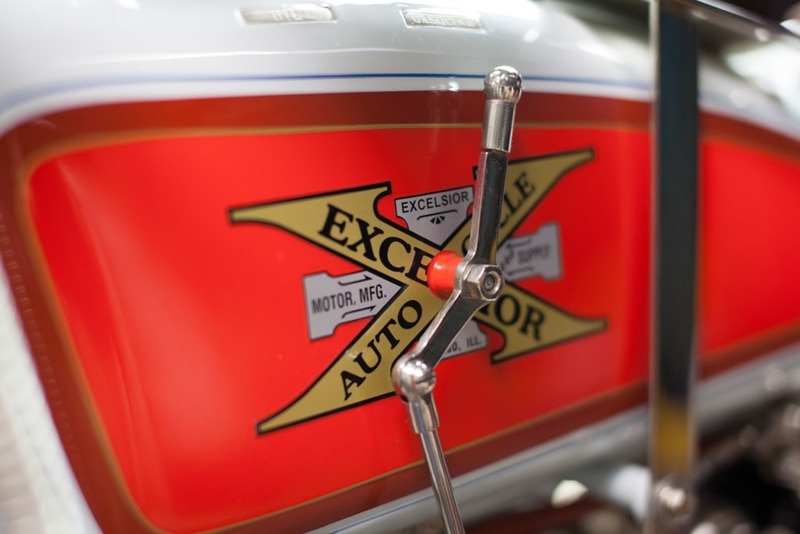 Flywheel magnetos originated in 1914 when Johnson set a team to work to build a better ignition for their outboard motors. Like most people, I thought a flywheel mag was a flywheel mag. Wrong!. 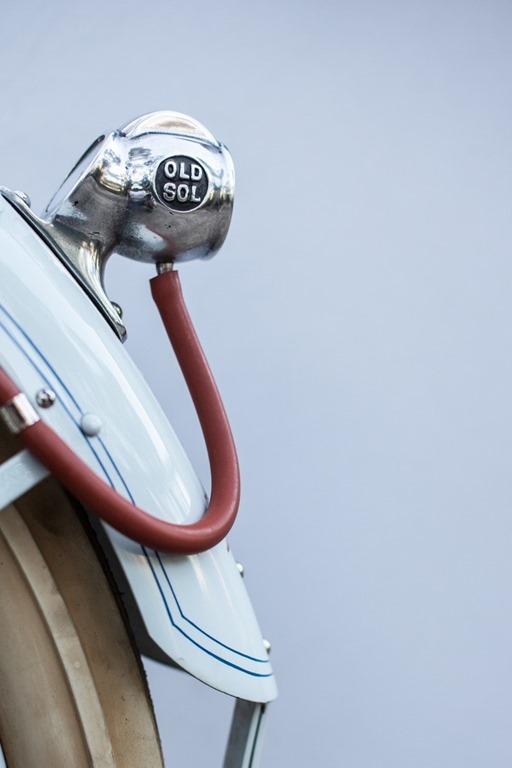 Over the years there have been many subtle changes to the way these things are designed and work. My magneto comprised a back plate with my ‘home made’ contact points, an original lighting coil, and a gap where the ignition coil should be. The aluminium flywheel carried four steel magnets butted up to each other and riveted in place. Any magnetism had long gone. Rather than start completely from scratch, I investigated the possibility of adapting a coil from another motor. The best option appeared to be a chainsaw coil mounted on new laminations. A suitable coil was located, and laminations designed, and a great stack was cut from .5mm steel, another job for the profile cutting man. Once the coil had been assembled and mounted on the back plate, the plate was attached to my wee lathe, and with some nasty lash ups, managed to face off the coil with an electric die grinder, slow, but it worked. Then the magnets were removed from the flywheel and magnetized in a north / south pattern that looked logical. They were then fitted back to the flywheel for a trial run. With just a bare crankcase and crankshaft, it was possible to assemble the magneto, and spin it with an electric drill on the flywheel nut. Nothing, zilch. Tried attaching a 3w bulb to the coil primary, and still nothing; obviously a fundamental error somewhere. Time to chase up some old work colleagues for some serious discussions. All agreed that ‘it should work’ but why it didn’t was baffling. After much discussion I tried assembling two of the magnets backwards, north to north and south to south, which sort of defies logic, but it made sparks. And the magnets quickly quickly lost magnetism. By this time I had invested many, many hours into an ignition system that still was not ‘there’, so I decided to go to plan B, and a simple battery / coil system, using the existing magneto contacts and condenser, with an external coil and battery. Meanwhile an old style heavy duty cycle frame was renovated with paint, lots of nickel plate, and some very old “Victor” decals from the long gone Baker Cycles. 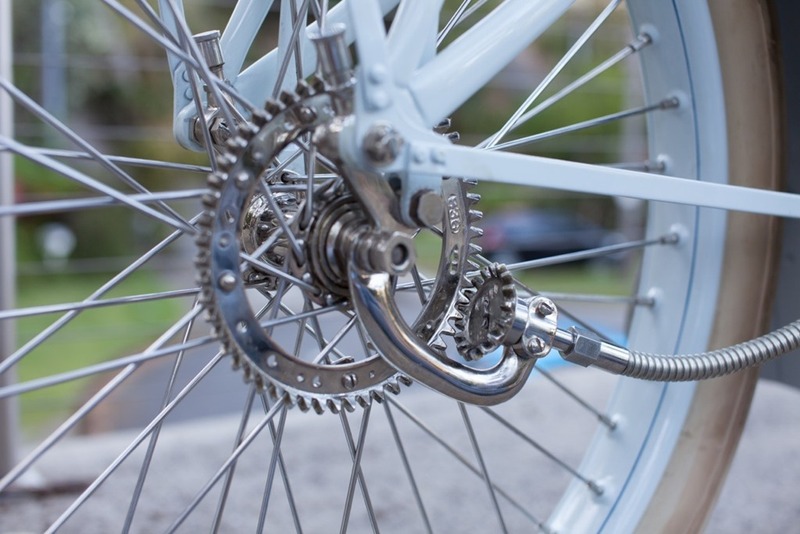 One deviation from all the old pictures was the addition of a cycle type hub brake to the front wheel in the interest of self preservation. The whole lot came together in October 2010, and after a few cautious trips around the block, trying to find the best settings for everything, I decided to enter the Canterbury Branch Annual Veteran Rally. 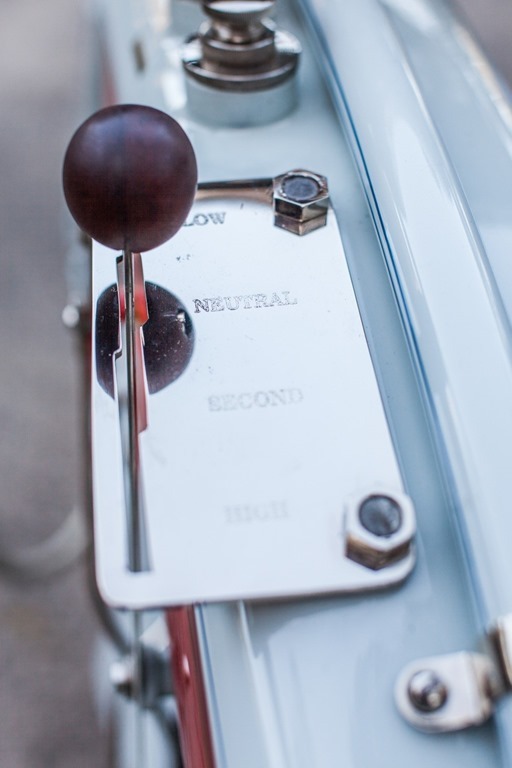 With no clutch or engine disengagement, every stop becomes a challenge. 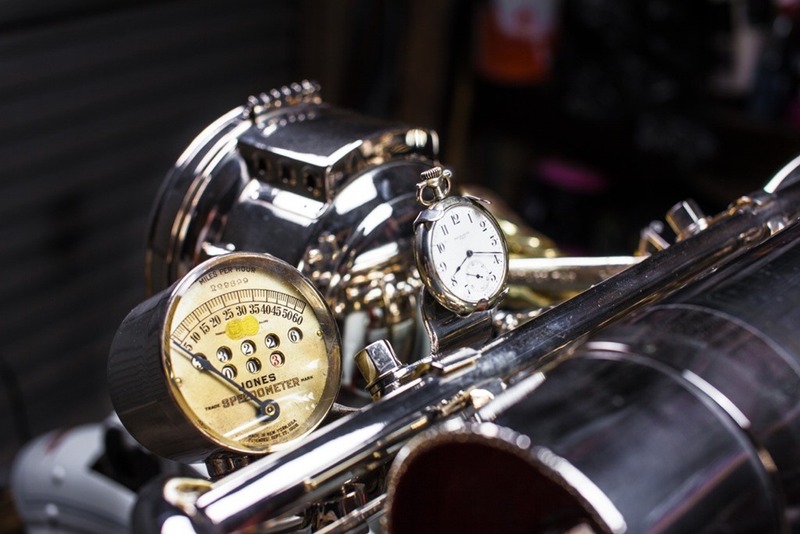 Most times I got it right and the Motor Wheel popped along happily at 12 – 15 miles per hour, giving me plenty of time to survey the world around me. When I got the starting procedure wrong, I got hot and bothered very quickly, certainly sorts out how unfit I am! Forty miles was some proving run, and still going, but I was definitely glad to get off that old cycle seat. How something so small turned into the toughest project I have attempted is hard to credit, but I am sure my previous car and motorcycle projects were far simpler in almost every respect.With all the research I did over the years, I followed up every lead that appeared, and was never able to make contact with another owner, so I was very much on my own. That said, the many people I contacted for help and advice, and those that made bits that were beyond my skills, all took a real interest in the project, and their help has been huge. Thanks everybody, I really appreciate your help. 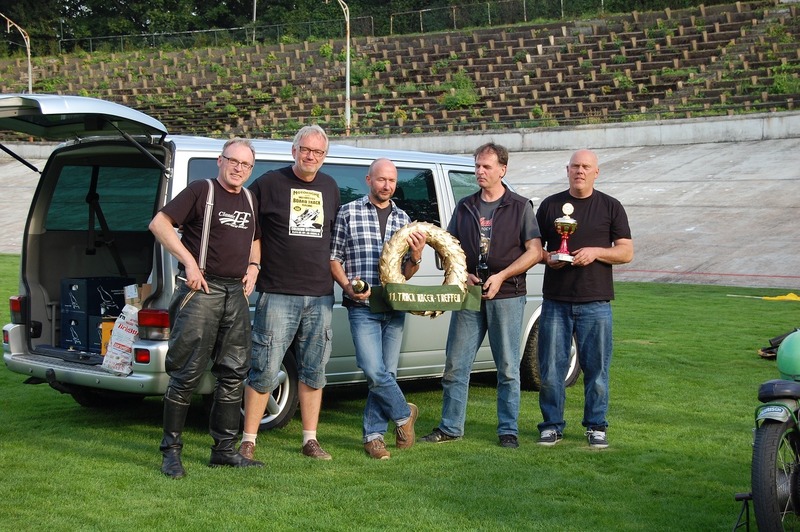 The bottom line is that the challenge has been worth it, and the number of Merkel Motor Wheels that are actually in running order may now have passed half a dozen. I am certainly not likely to park next to another. I recently found a search engine that gives articles from the Australian papers of the past 100+ years. 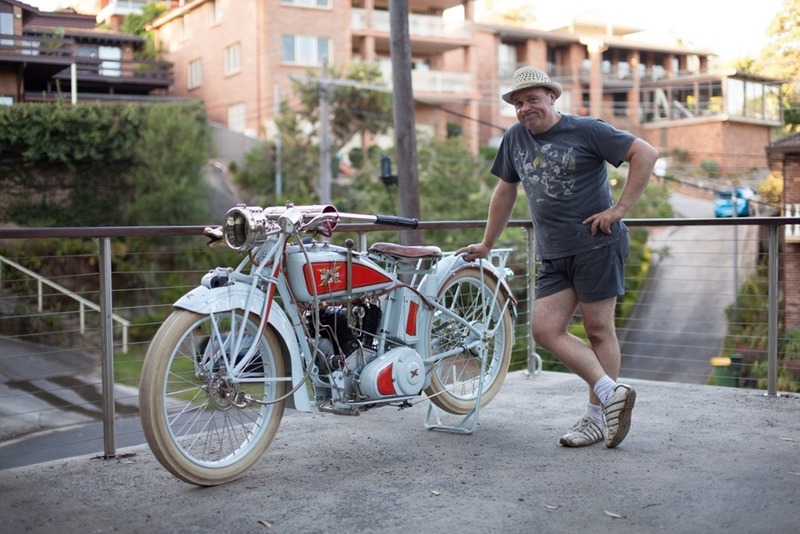 Give it a try here: http://trove.nla.gov.au/ So of course I typed in “Veloce Motorcycle” and was pleased to find several hits including the nice article that I’ve copied and posted below. 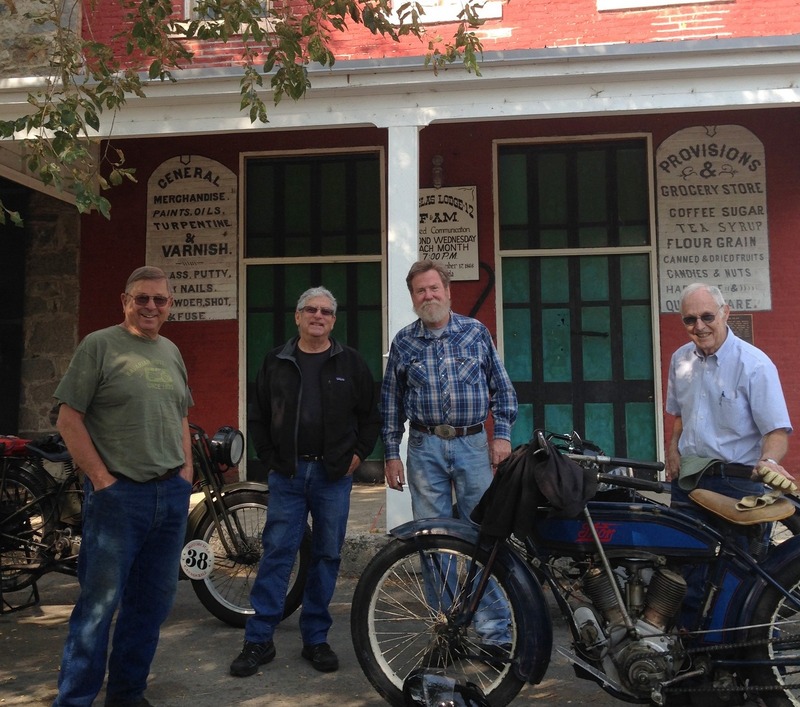 On King’s’ Birthday, the Victorian MotorCycle Club conducted its reliability contest between Melbourne and Ballarat. Forty out of 45 entrants made the early morning start0n the long, cold journey. 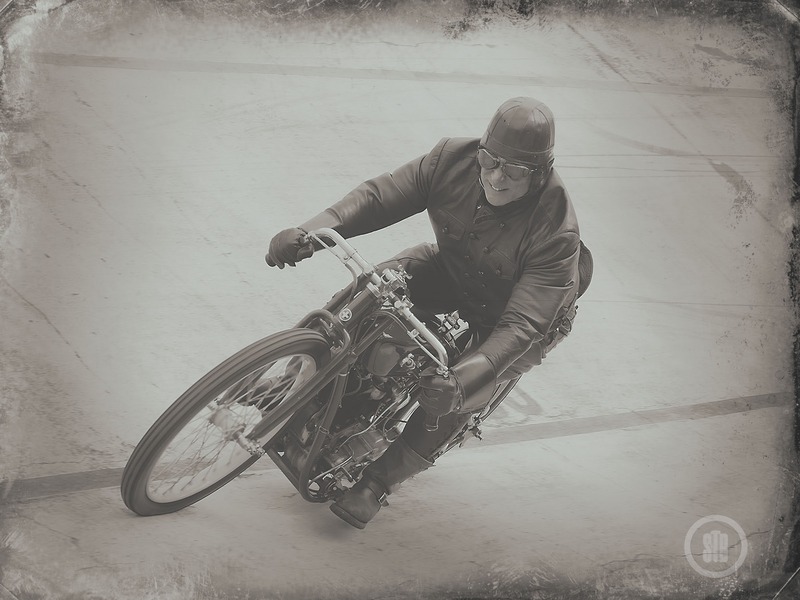 Eight cycles with side-cars competed in a separate class,most of them bearing a woman passenger,closely muffled in furs. 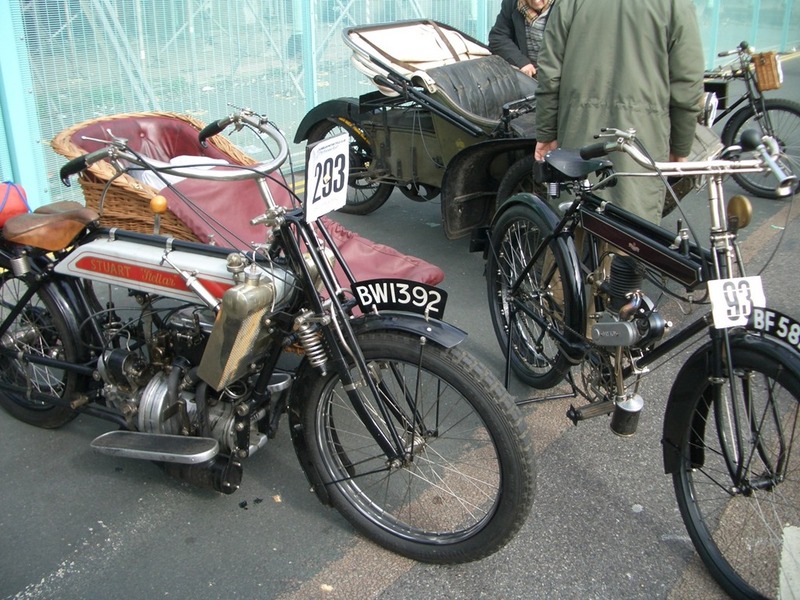 The first to leave was Mr E. Huut, with side-car and passenger, on a 3 1/2hp Rover; Mr G. Truman following ou a 3 1/2 h.p, Triumph. 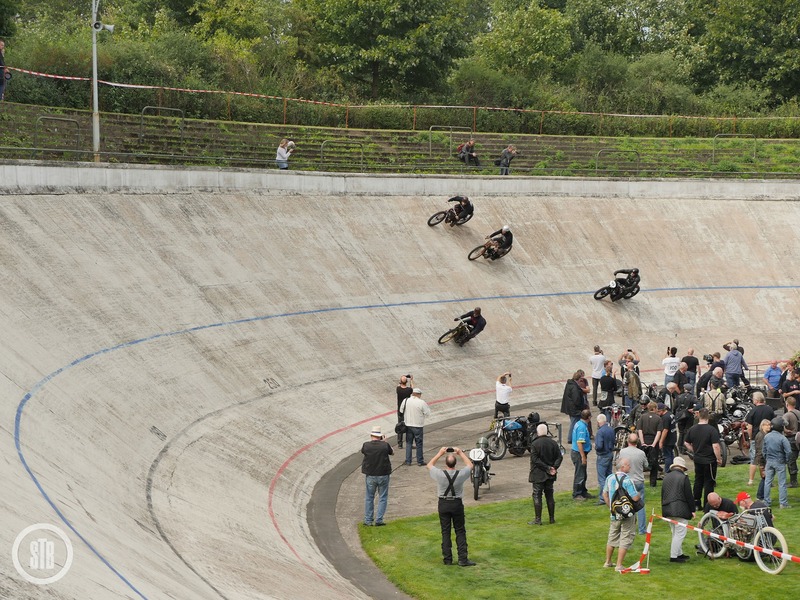 There was little delay in starting, but the last competitors were-not away until nearly 8.4o. Out of the 45 entries, 40 started at intervals of one minute. 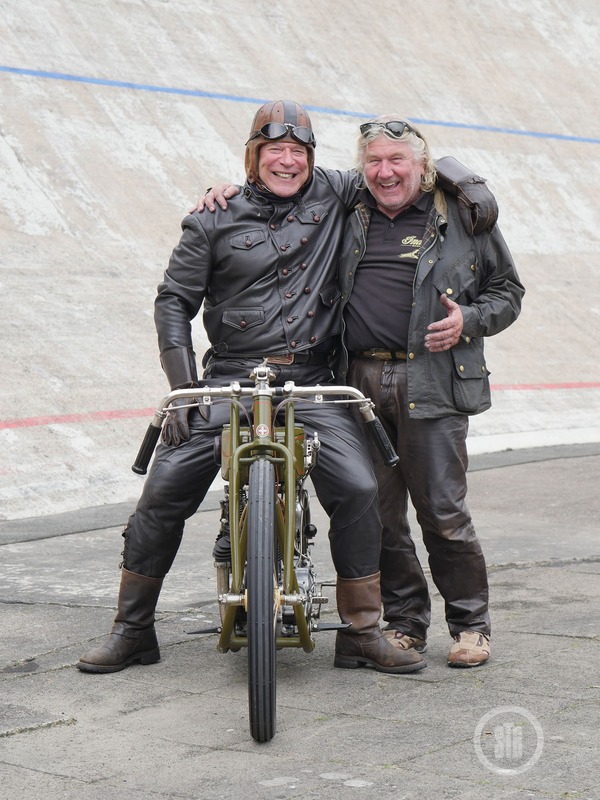 J. K. Gurwen-Walker, winner of many competitions., competed in the sidecar class with a 7 h.p. Indian. He was the winner of the club’s 100-mile race run on ,April 27, in the fastest time on record. Following a minute later was L. Fallon, on the ,smallest cycle in the event—a 2 1/4 h.p. Levis. * At Anthony’s cutting, nearly 30 miles from Melbourne, an observer was stationed for thereturn journey, and points were deducted from competitors for failing to climb the- hill or for pedalling up. 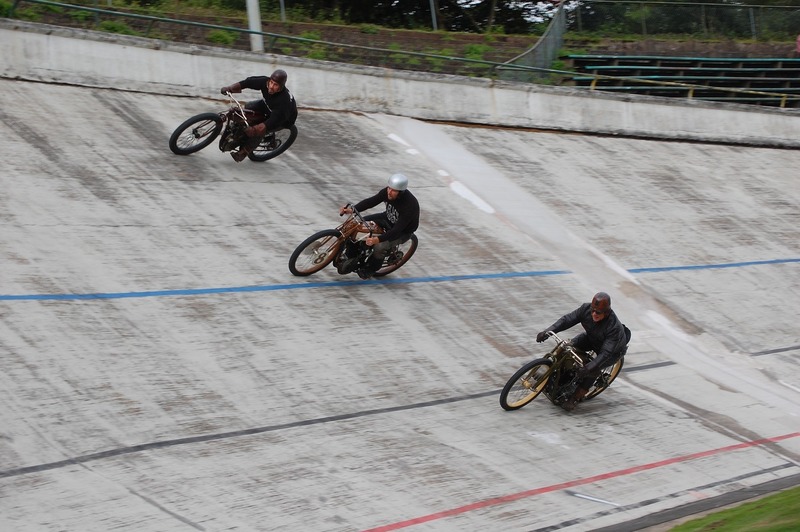 No dismounting to cool the engine or to lower the gear was allowed.Competitors had to climb the hill without pause. About three miles on the Ballarat side of Bacchus Marsh J. Gunst (3 1/2 Triumph) left the road and crashed into a fence. Gunst was thrown heavily on his head. Ho sustained a deep cut over the eye. 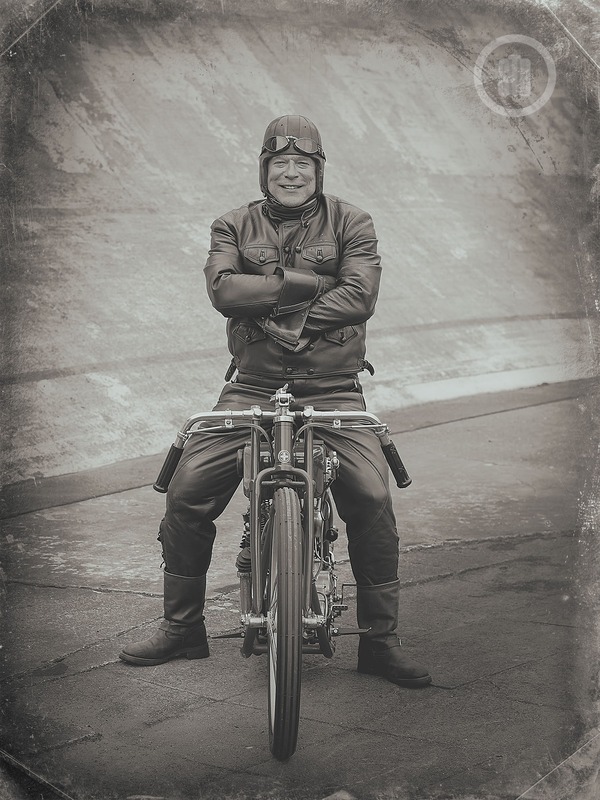 His riding companion (P. Allardyce) stopped, and rendered assistance, and in a few minutes a side car machine, ridden by G. A. Ambrose appeared. Ambrose stopped, and seeing that Gunst was badly hurt, placed him in his side-car, and sped back with him to Bacchus Marsh. There he was attended to by DrRyan and a St. -John ambulance telephoned for. In two and a half hours after the fall Gunst was receiving attendance at the Melbourne Hospital. 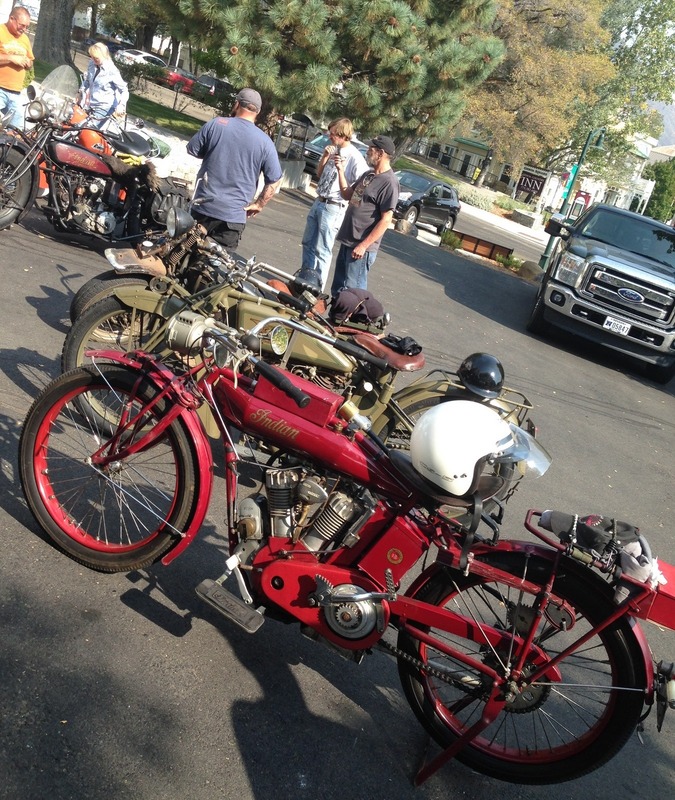 The event was, of course, a reliability contest, and not a race. 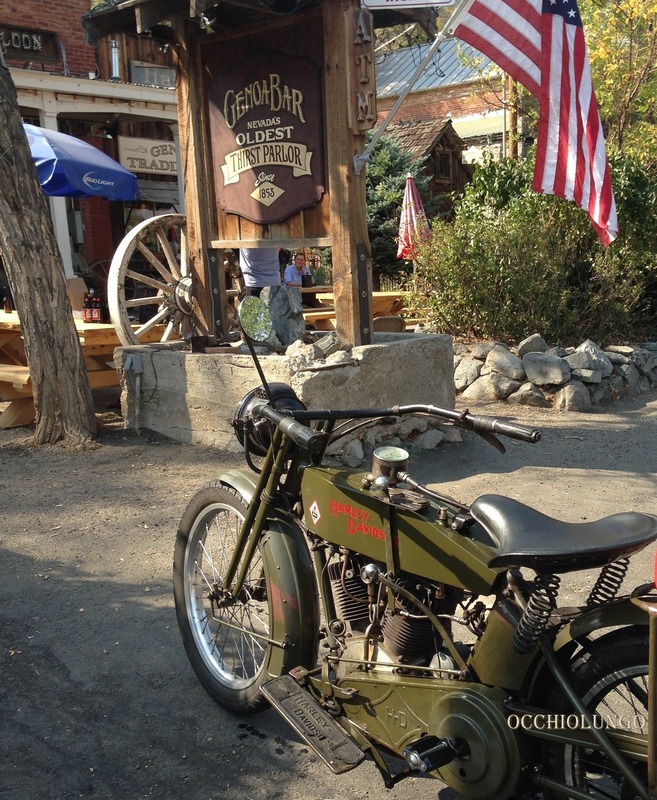 Side-car machines hadto maintain an average speed of 15 miles an hour, machines up to 5 h.p. 20 miles an hour,and machines over that power had to maintain an average throughout of 22 miles an hour. 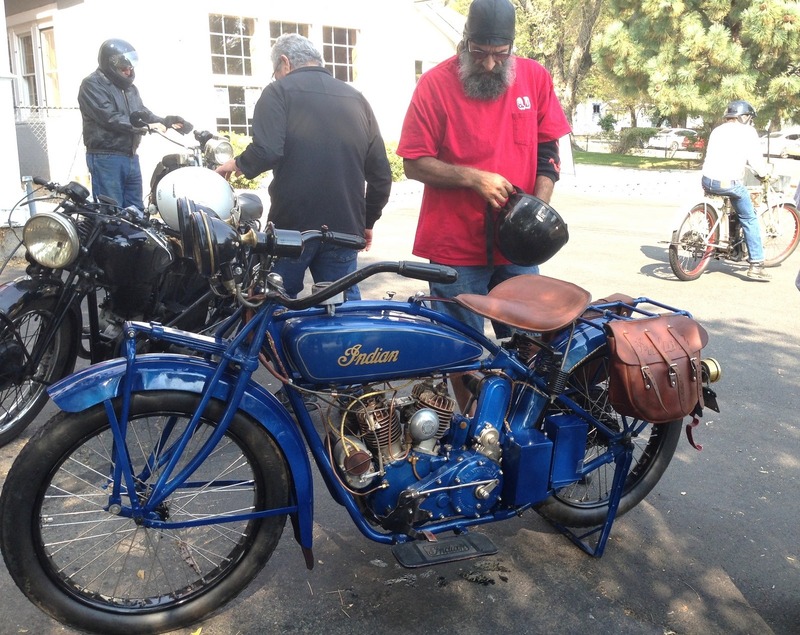 Most of the riders arrived at Ballarat on time, where the control was in charge of members of the Ballarat Motor-cycle; Club.After a good lunch the riders set out again for Melbourne. 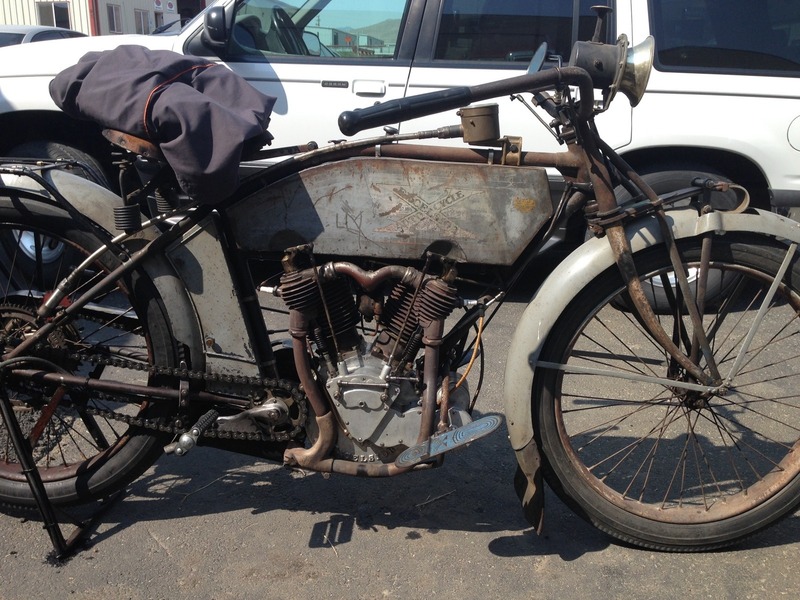 Trueman 3 1/2 Triumph), on time. 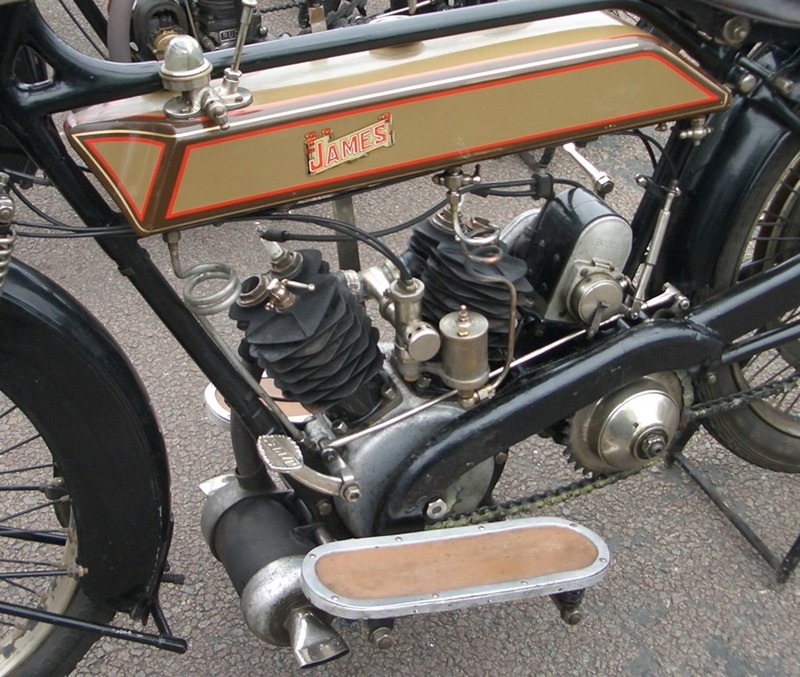 Bavley (6 J.A.P. ), on time. S. Jenkins (6 J.A.P. ), on time. 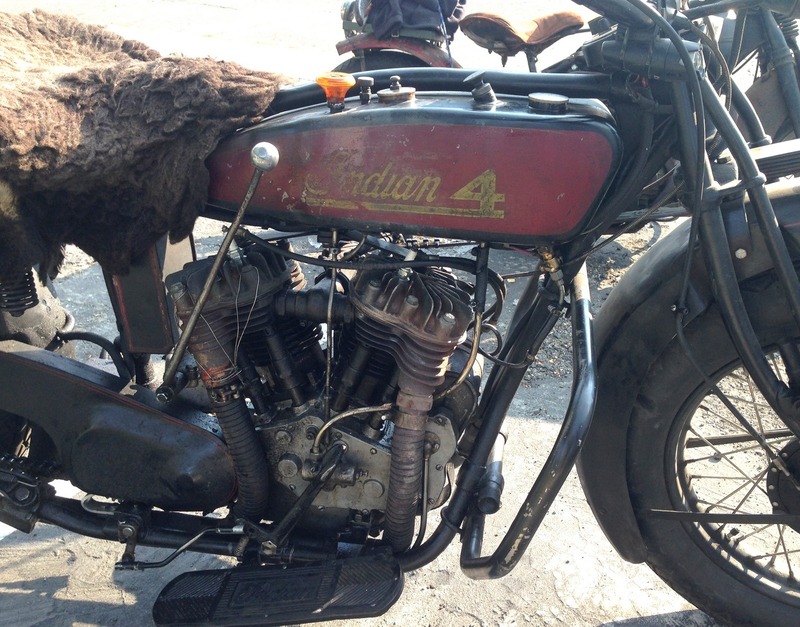 H Atkinson (7 Indian), 12 min. early. K. Walker (7 Tndian), on time.K. Tvler (7 Indian), on time. 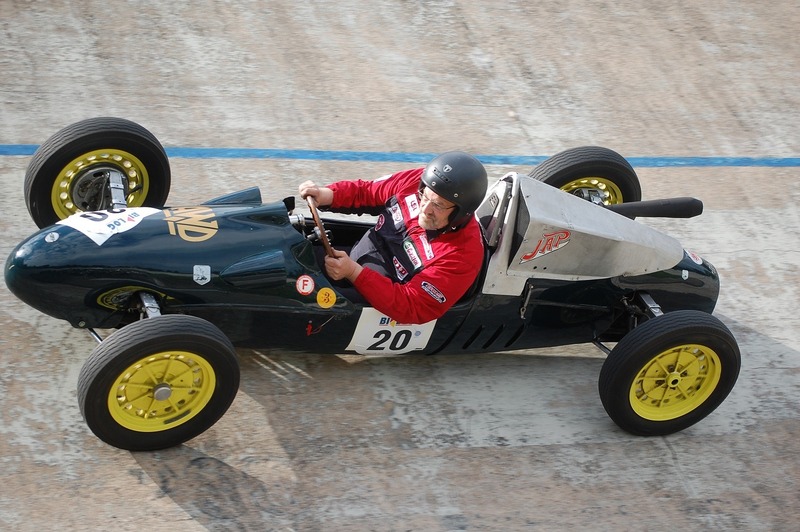 F. Mavman (3 1/2 Triumph), on time.J. Mavman (3 1/2 Triumph), on time. H Shaw (3 1/2 Triumph), 1 min. late..
C. Kelynack (3 1/2 Triumph), 1 min. late.J. Gunti (2 1/2 Sunbeam), on time. C. Trcgea. (3 1/2 Triumph), on time.S Clinton (3 1/2 Rover), on time. 11. Morgan (4 1/2 Precision), on time. W. Luxford (3 1/2 Precision), 7 min. late.F. Clinton (3 1/2 Precision), 7min. late. Shacklock (3 1/2 Rudge), on time. W S. VMnov (3 1/2 N.S.U. ), on time. ,A." Monkhowse (2 1/2 Singer), on time.r. Thoren (3 1/2 Ariel), 4 min. oarly. H. Haquic (3 1/2 Veloce), on time. Pouulas, (3 1/2 Veloce), 33 min. late. H. Ernst (3 1/2 Singer), on time. K George (7 Indian), on time.S. Gahan (7 Indian), on time. R. Malcolm (7 Pope), on time.J. Butson (7 Pope), on time. J. M’Quade (7 Pope), on time..1. Booth (7 Indian), on time. if. Jenkins (7 Indian), on time. 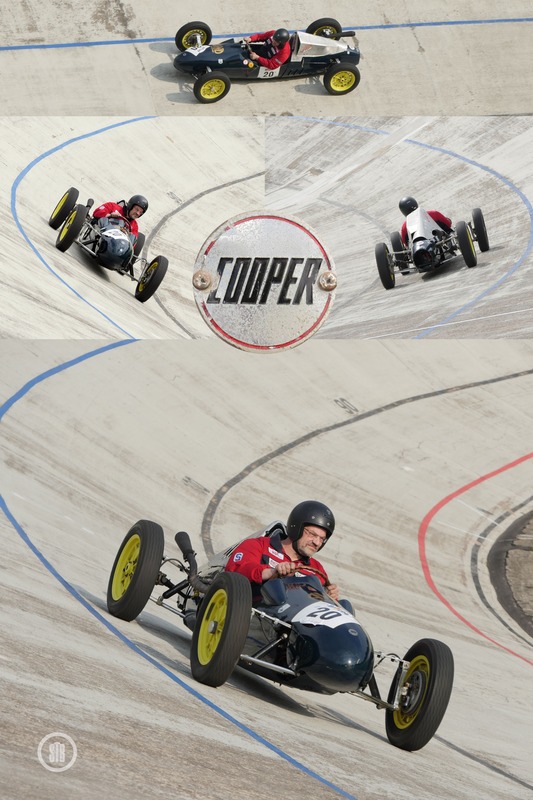 Following is the list of competitors and machines:—Side-car competitors. E. lluu ,3U-h.p. Rover: G. Truman, 3^.-h.p. Triumph;0." Ambrose, 3V>-li.p. Triumph; J. Rogers, 5h.p. Rudge; J. S. Bayley. 6-h.p. Bradbury; b.Jenkins. 6-h.p. Jr.A.P. ; H. O. Atkinson 7h.p. Indian; J K. Curwen. Walker, 7-h.p.Indian. Ordinary.—L. Fallon, 2V*-h.p. Levis,E. Tyler, 3Vs-h.p. 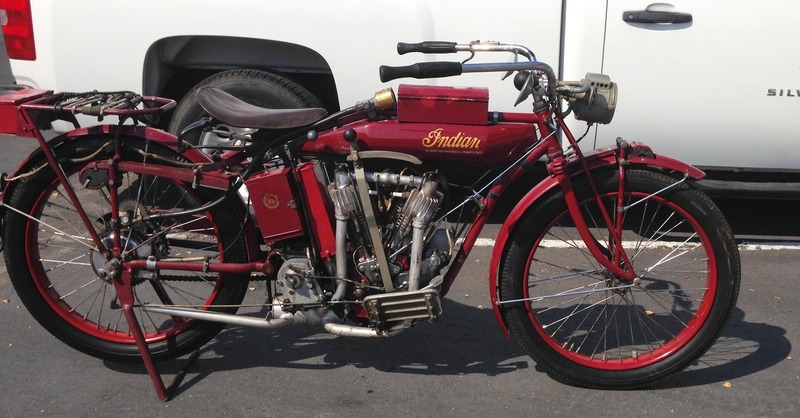 Indian; K. Mayman, „V2-b.p.Triumph; J. Mayman, 3U-h.p. 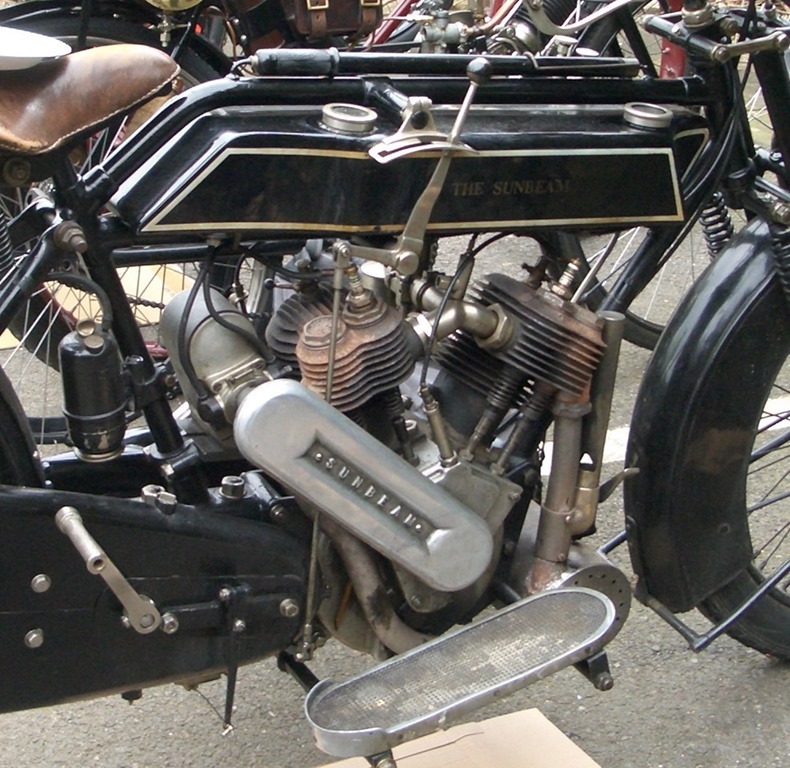 Triumph; H.R. Shaw. 3^-h.p. Triumph; J. Kelynack, 3^h.p. 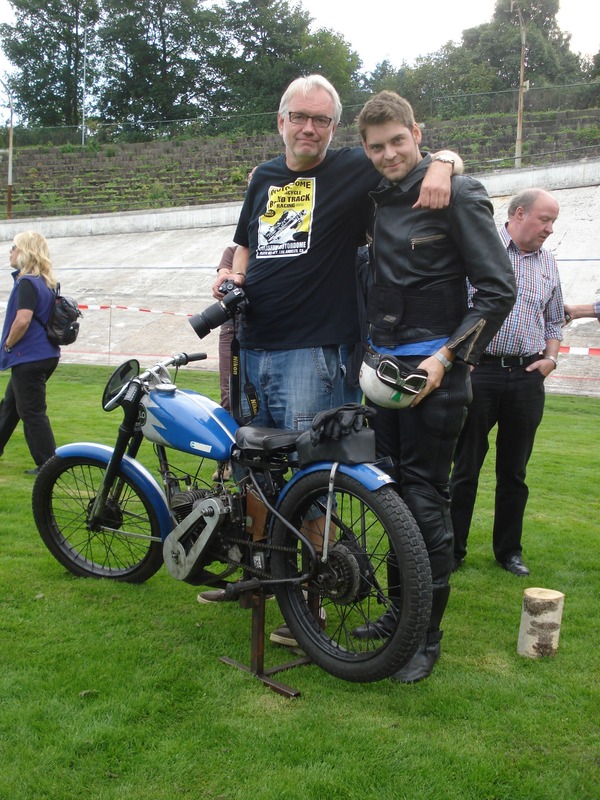 Triumph; J. Gunst, 3’^-h.p. Triumph,T>. Aliardlce, r,^.-h.p. Triumph; J. Gunn, o^li.p. B.S.A. ; C. Tregea, 3%-h.p. B.b.A. ; u.Parson? 3Mi-h.p. Rover; F. Clinton, S^-h-PRover; H. Morgan, 4’4-h.p. 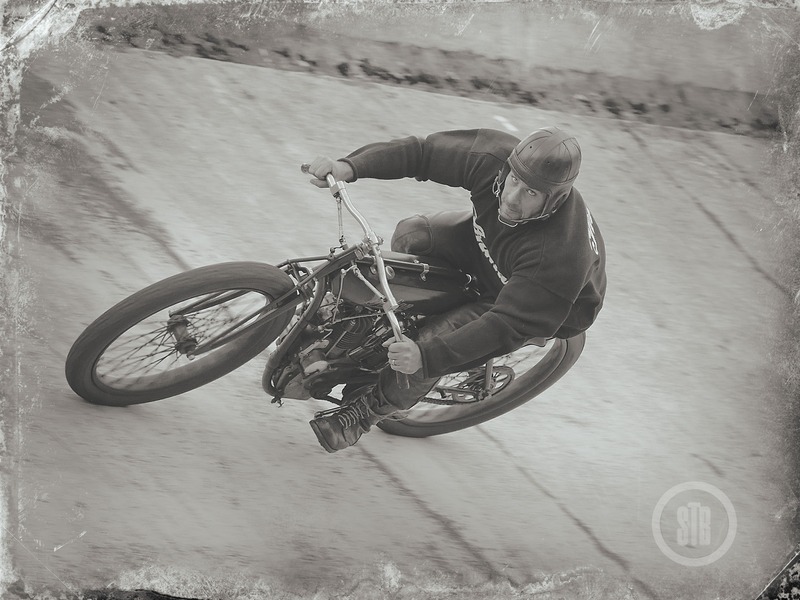 Precision; W.Luxford, ?,V’-h.p. Precision; S. Clinton,h.p Precision; H. Shscklock, S^-h.p- Rudge,W. S. Edney, 3&-h.p. N.S.U. ; A. Monkhouso,H’s-h.o. Singer; N. Ferguson, 3M>-h.p. Ariel;E." Thoren. 3^-h.p. Ariel; V\ Foley, 3 1/2-h.p. Veloce– H. C. Baquie, 3%-h.p. Ariel; P. UPriestiev, 6-h.p. Ideal; R. Douglas, S-h. p.J.A.P. ; K. Georgo. 7-h.p. Indian; &. Gahan,7-h.p. Indian; R. Malcolm. 7-h.p. Pope; b. D.Rulson, 7-h.p. Pope; I. M’Quade, 7-h.p. Pope. Others who started were Ernst, Booth, and Jenkins.